The information required by Part III of Form 10-K is incorporated herein by reference to the Registrant's definitive proxy statement to be mailed to the shareholders of the Registrant by April 30, 2011. The Private Securities Litigation Reform Act of 1995 (the "Reform Act") and Section 21E of the Securities Exchange Act of 1934, as amended, (the "Exchange Act") provide a safe harbor for forward-looking statements made by or on behalf of Kenneth Cole Productions, Inc. (the "Company"). The Company and its representatives may from time to time make written or oral statements that are "forward-looking," including statements contained in this report and other filings with the Securities and Exchange Commission (the "SEC") and in reports to the Company's shareholders. Forward-looking statements generally refer to future plans and performance and are identified by the words "believe," "expect," "anticipate," "plan," "intend," "will," "estimate," "project," or similar expressions. All statements that express expectations and projections with respect to future matters, including, but not limited to, the launching or prospective development of new business initiatives, future licensee sales growth, gross margins, store expansion, openings and closings, changes in distribution centers and implementation of management information systems, are forward-looking statements within the meaning of the Reform Act. These statements are made on the basis of management's views and assumptions, as of the time the statements are made, regarding future events and business performance and are subject to certain risks and uncertainties. Should one or more of these risks or uncertainties materialize or should underlying assumptions prove incorrect, actual results may vary materially from those anticipated, estimated or projected. While the Company does communicate from time to time with securities analysts, it is against Company policy to disclose to them any material non-public information. Shareholders should not assume that the Company agrees with any statement or report issued by an analyst, regardless of the content of such statement or report. To the extent that reports issued by securities analysts contain any projections, forecasts or opinions, they are not the responsibility of the Company. There can be no assurance that management's expectations will necessarily come to pass. A number of factors affecting the Company's business and operations could cause actual results to differ materially from those contemplated by the forward-looking statements. Those factors include, but are not limited to, changes in domestic economic conditions or in political, economic or other conditions affecting foreign operations and sourcing, demand and competition for the Company's products, risks associated with uncertainty relating to the Company's ability to implement its growth strategies or its ability to successfully integrate acquired business, risks arising out of litigation or trademark conflicts, changes in customer or consumer preferences on fashion trends, delays in anticipated store openings and changes in the Company's relationship with its suppliers and other resources. This list of factors that may affect future performance and the accuracy of forward-looking statements are illustrative, but by no means exhaustive. Accordingly, readers of this annual report should consider these facts in evaluating the information and are cautioned not to place undue reliance on the forward-looking statements contained herein. The Company undertakes no obligation to update or revise publicly any forward-looking statements, whether as a result of new information, future events or otherwise. The Company designs, sources and markets a broad range of fashion footwear, handbags and apparel and, through license agreements, designs and markets apparel and accessories under its Kenneth Cole New York, Kenneth Cole Reaction, Unlisted and Le Tigre brand names, as well as footwear under the proprietary trademark Gentle Souls. In addition, the Company designs, develops and sources private label footwear and handbags for selected retailers. The Company's products are targeted to appeal to modern fashion conscious consumers who seek accessible designer fashion that reflects a metropolitan lifestyle. These products include core basics that generally remain in demand from season to season and fashion products that are designed to establish or capitalize on market trends. The combination of core products and fashion styles provides freshness in assortments and maintains a fashion-forward image, while a multiple brand strategy helps diversify business risk. The Company markets its products to approximately 5,200 domestic department and specialty store locations, the Company's full-priced retail stores, Company Stores ("outlets" or "outlet stores"), and its e-commerce website, as well as internationally through its licensee partners and international retailers. The Company believes the diversity of its product offerings distinguishes the Company from its competitors in terms of product classifications (men's, women's and children's footwear, apparel and accessories), prices ("bridge," "better" and "moderate") and styling. The Company believes the diversity of its product mix provides balance to its overall sales and increases opportunities in all channels of distribution. sunglasses, prescription eyewear, watches, jewelry and fragrance. Women's product categories currently being sold pursuant to license agreements include sportswear, outerwear, swimwear, sleepwear, small leather goods, belts, sunglasses, prescription eyewear, watches, jewelry and fragrance. In addition, the Company licenses luggage and children's apparel. In October 2010, the Company announced that it had made the strategic decision to terminate the licensing agreement with its women's sportswear licensee effective June 1, 2011, and will be bringing the business in-house starting with the Fall 2011 season. 1) CREATING COMPELLING PRODUCT that represents the metropolitan lifestyle of the Kenneth Cole brand and offers customers modern styling, innovative design elements and a strong price-value relationship. 2) ENERGIZING THE BRAND through creative marketing and advertising that is consistent across consumer touch points to ensure that Kenneth Cole is known as the quintessential metropolitan lifestyle brand for modern men and women. 3) ACCELERATING RETAIL to showcase the full product assortment of the Kenneth Cole brand through Company-owned stores and its e-commerce website and provide customers with an engaging shopping experience. 4) EVOLVING WHOLESALE by working closely with retail partners to leverage the power of our brands across multiple categories and provide targeted assortments that meet the needs of individual retailers. 5) GOING GLOBAL by focusing on increasing penetration in existing markets and selectively entering new territories with high growth potential. 6) BUILDING A WINNING, CONSUMER-DRIVEN CULTURE with an emphasis on building strong talent and improving operating capabilities. The Company designs, markets, distributes and licenses a broad range of lifestyle products including footwear, apparel and accessories for men, women and children. Footwear, handbags and men's sportswear are developed in-house and all other categories are licensed. Footwear: Products include a broad selection of men's, women's, and children's footwear across multiple categories and wear occasions. Handbags: Handbag collections include a broad range of leather and non-leather styles suitable for multiple end uses. Sportswear: Assortment includes an extensive collection of men's sportswear including knits, wovens, pants, sweaters, and jackets, as well as a limited assortment of women's ready-to-wear that is sold exclusively through the Company's owned retail stores and website. Working closely with its licensee partners, the Company has been able to extend its brands into a wide variety of categories including jewelry, fragrance, watches, luggage, small leather goods, swimwear, hosiery, eyewear, women's sportswear, men's tailored clothing and neckwear, outerwear, and sleepwear among others. The Company has a strong portfolio of well-known and differentiated brands including Kenneth Cole New York, Kenneth Cole Reaction, Unlisted, Gentle Souls, and Le Tigre. Each of these brands has a distinct positioning and appeals to targeted consumer groups, as described below. The Company believes that further segmentation and development of the brands affords significant growth potential within each of the Company's business segments. Kenneth Cole New York is modern, day-to-night, work-to-weekend fashion for men and women 25 - 44 aspiring to live the metropolitan dream. The collection is designed for a sophisticated, modern consumer looking for accessible designer fashion. Kenneth Cole New York has evolved into a full lifestyle collection with broad appeal, and offers a strong balance of fashion-forward styles and core basics across men's and women's footwear, apparel, and accessories. Kenneth Cole New York is both aspirational and authentic, offering consumers a glimpse into Kenneth Cole's chic metropolitan lifestyle, and competes with contemporary designer collections generally at bridge price points. As a result of strong brand recognition and a reputation for style, quality and value, the Company believes that Kenneth Cole New York is an important resource for better department and specialty stores, both within the United States and internationally. Kenneth Cole New York is also sold within the Company's owned retail stores and online at www.kennethcole.com. Kenneth Cole Reaction is a full lifestyle brand that offers cool, casual, modern style with an energetic, downtown sensibility. The brand provides well-priced designer fashion, with unique design details principally to young men and women 18 - 35. Kenneth Cole Reaction offers a broad range of men's, women's, and children's footwear, apparel and accessories generally at better price points. The brand emphasizes versatility, contemporary styling, and value, and is ideal for a broad range of wearing occasions including work, weekend, and evenings out. Kenneth Cole Reaction is primarily sold in department stores nationwide, in the Company's owned retail stores, online at www.kennethcole.com, and internationally. In March 2010 the Company entered into an exclusive relationship with Macy's to market and distribute Kenneth Cole Reaction men's sportswear. Upon its launch in fall 2010, Kenneth Cole Reaction sportswear is now sold exclusively at Macy's in 210 stores. The Unlisted brand offers trendy, affordable footwear and accessories for children as young as one year old and for young men and women 15 - 25. The Unlisted brand provides modern styling at more moderate prices, and enables the Company to target a younger consumer base. The brand offers men's footwear, women's footwear, and women's handbags for a range of casual and dressier occasions, and is primarily sold in mid-tier department stores and national chains. Gentle Souls organic women's footwear combines extraordinary comfort with everyday style for smart, sophisticated women 35 - 50. Gentle Souls offers patented comfort technology and high-quality materials across a range of women's footwear for work and everyday wear. Gentle Souls is sold at a limited selection of specialty stores, in better department stores, in the Company's owned retail stores and online at www.kennethcole.com. Le Tigre is a preppy, casual lifestyle brand targeting young men and women 18 - 30. The brand offers consumers colorful, retro-inspired, all-American apparel, footwear, and accessories for the weekend and casual workplace. In November 2007, the Company entered into a two and a half year agreement with JC Penney ("JCP") to relaunch the brand within JCP stores. The Company and JCP mutually agreed not to renew the agreement upon expiration in July 2010. Le Tigre is currently distributed through several domestic Kenneth Cole outlet stores, e-commerce and has select licensed distribution in Asia and the United Kingdom. The wholesale channel represents roughly half of total net revenues and includes sales to department stores, independent specialty stores, national chains and mass market retailers. The Company continues to reinforce the segmentation of its brands in wholesale by clarifying brand positioning and developing unique product assortments for key retail partners. This segmentation approach provides opportunities to increase market penetration, attract new customers and further enables the Company to address a wider variety of customers' needs, both domestically and internationally. To develop this channel, the Company leverages its aspirational, lifestyle marketing, and works with retail partners to ensure the in-store experience is memorable and engaging. The Company employs a sales force, as well as corporate account specialists, to sell its products and to manage its relationships with its wholesale customers. The Company continues to tightly manage inventory in this channel given current market conditions. The Company's products are distributed to approximately 1,100 wholesale accounts for sale in approximately 4,700 store locations domestically. The Company markets its branded products to major department stores, such as Macy's and Dillard Department Stores, and upscale specialty retailers, including Bloomingdales and Nordstrom. In addition, the Company sells its products to independent retail stores and footwear chains throughout the country. The Company sells out-of-season branded products and overruns to off-price retailers. The Company markets its product lines and introduces new styles at separate industry-wide footwear, handbag and apparel tradeshows that occur several times throughout the year in New York, Las Vegas, Milan, Italy and at various domestic regional shows. These tradeshows also afford the Company the opportunity to assess preliminary demand for its products. After each show, the Company's sales force and corporate account specialists visit customers to review the Company's product lines and to secure purchase commitments. The Company's products are also displayed at showrooms in New York as well as in various showrooms of its licensees for their specific product category. The Company commenced international wholesale distribution in 2007. Currently, the Company is partnering with retailers in Europe, Australia, Malaysia and the Middle East. The Company manages its Canadian footwear and handbag operations from its New York City headquarters with a sales staff and third-party distribution center in Canada. The Company markets its branded products in Canada to independent specialty retailers and large department stores, including Hudson Bay and Sears Canada. The Company designs, develops and sources private label footwear and handbags for selected retailers. These private label customers include major retailers that do not purchase the Company's existing brands. The Company's private label business requires minimal overhead and capital because the Company does not typically incur any costs related to importing, shipping or warehousing of inventory, all of which are usually borne by the private label customer. The Company's Consumer Direct segment, which operates full-priced retail stores and outlets, as well as e-commerce ("Internet"), affords significant growth potential and provides the ability to control the retail and brand experience for consumers. Retail stores and the e-commerce site provide a showcase for the brand, typically carrying a full lifestyle assortment of footwear, apparel, and accessories for both men and women. The Company believes that the Consumer Direct segment increases awareness of the Company's brands, reinforces the Company's image, and builds brand equity. As of December 31, 2010, the Company operated 105 full-priced retail stores and outlets as compared to 110 stores as of December 31, 2009. The Company continues to pursue opportunities to optimize its retail operations through select store openings, closings, and right-sizings. At December 31, 2010, the Company operated 33 Kenneth Cole full-priced retail stores and 72 outlet stores under the Kenneth Cole name. The Company opened 5 outlets in 2010 under the Kenneth Cole name and one Kenneth Cole full-priced retail store. In addition, the Company closed 6 full-priced retail stores in 2010, one outlet store under the Kenneth Cole name and 4 outlet stores under the Le Tigre name. Subsequent to December 31, 2010, the Company has closed an additional seven full-priced retail stores, including its Rockefeller Center location, and plans to close two additional stores in the first half of 2011. A portion of the products sold in the Company's full-priced retail stores are sourced exclusively for those stores to differentiate the product mix from that of its wholesale customers. Similarly, a portion of the products sold in outlets are sourced exclusively for those stores to differentiate their product mix from that of full-priced retail stores and wholesale customers, and to enhance merchandising and improve gross margins. To drive real estate productivity in all of its stores, the Company is focused on enhanced merchandising and assortments, improving the price-value of its products, creating a memorable and engaging customer experience, maximizing conversion opportunities, and improving core processes including inventory planning and fulfillment. The Company believes that its retail stores represent an opportunity for future revenue and earnings growth. The Company maintains a website to provide information regarding the Company and its products, as well as to conduct online business. The Company believes that its website not only serves as an alternative distribution channel and source of incremental revenue, but is also a key communications vehicle to build brand equity, raise consumer awareness, and drive traffic to Kenneth Cole retail stores and the stores of wholesale partners. The Company continues to invest in enhancing its website, www.kennethcole.com, to improve navigation, visual presentation, and the overall customer experience. The Company also maintains two toll-free telephone numbers (1-800-KEN-COLE and 1-800-UNLISTED), which provide customer service and answers to product-related questions. In July 2008, the Company outsourced customer care, fulfillment and website functionality responsibilities related to its internet business to a third party that provides direct-to-customer e-commerce services. The Company believes its strategic licensing relationships are essential to the growth of the Company both domestically and abroad. Many of the existing licensee businesses are still relatively small in their individual product classifications and the Company believes they hold growth potential. The Company chooses its licensing partners with care, considering many factors, including the strength of their design, sourcing and distribution abilities, thereby attempting to maintain the same value and style that Kenneth Cole customers have come to expect. The strength of the Company's brands, Kenneth Cole New York,Kenneth Cole Reaction,Unlisted, and Le Tigre provides opportunities, through licensing agreements, to expand into new product categories and broaden existing distribution channels. The Company views its licensing agreements as a vehicle to meet the needs of consumers without compromising on price, value or style. The Company considers entering into licensing and distribution agreements with respect to certain products if such agreements provide more effective design, sourcing, marketing and distribution of such products than could be achieved internally. The Company continues to pursue opportunities in new product categories that it believes to be complementary to its existing product lines. Licensees range from medium-sized manufacturers to companies that are among the industry leaders in their respective product categories. The Company selects licensees that it believes can produce and service quality fashion products consistent with the Kenneth Cole New York, Kenneth Cole Reaction, Unlisted, and Le Tigre brand images. The Company communicates its design direction and coordinates all marketing efforts with its licensees. The Company generally grants licenses for three to five year terms with renewal options, limits licensees to certain territorial rights and retains the right to terminate the licenses if certain specified sales levels are not attained. Each license provides the Company with the right to review, inspect and approve all product designs and quality and approve any use of its trademarks in packaging, distribution, advertising and marketing. The Company plans to continue to draw upon the creative strength of its founder, Kenneth D. Cole, and its design team, as well as its marketing resources to ensure brand integrity with its licensing partners. The Company's licensees of the Kenneth Cole New York, Kenneth Cole Reaction, and Unlisted brands are required to contribute to the Company a percentage of their net sales of licensed products, subject to minimum amounts, for the ongoing marketing of the Kenneth Cole brands. The Company currently has a corporate gift program, whereby corporate customers are sold Kenneth Cole items for award and recognition programs through a third-party provider. Orders are drop-shipped from the Company's licensees or its warehouses. The Company believes this is another avenue to enhance customer awareness and strengthen market position of its various brands. At December 31, 2010, the Company, through its licensees, operated 69 freestanding stores and 64 shop-in-shops around the world. In 2010, the Company opened 24 shop-in-shops in the Asian and Middle Eastern markets. In 2009, Le Tigre was launched in Taiwan and the Company expects further expansion into Asia and Latin America. The Company sells its products through distributors and licensees to wholesale customers and direct retailers in international markets including Canada, Mexico, South America, Central America, the Caribbean Islands, Europe, the Middle East, and Asia. The Company is also committed to expanding its product classifications internationally to leverage the capabilities of its licensing partners, particularly in watches, fragrance and eyewear. The Company's Latin American licensee agreement covers Mexico, Central America, South America and the Caribbean, with the exception of Brazil, Argentina and Uruguay. Currently, the Company's licensee operates 45 stores and various shop-in-shops in this region. Within the Middle East and Asia, the Company's licensees maintain 24 retail stores and numerous shop-in-shops at local department stores. The stores are located in the United Arab Emirates, Israel, Bahrain, Kuwait, Oman, the Philippines, Thailand and Taiwan. In Europe, the Company's licensee sells footwear to department stores within the United Kingdom and has also entered into an exclusive arrangement with a leading department store to sell men's tailored clothing, apparel, dress shirts and neckwear, as well as women's apparel and accessories in the United Kingdom. In Canada, the Company also continues to sell and market its products through its licensing partners excluding footwear and handbags which is distributed directly by the Company. The Company is planning the expansion of its international licensing programs as a means of developing a truly global brand, and believes that international markets represent an opportunity for future revenue and profit growth. The Company believes its international licensing partners will play a critical role in its go forward strategy, and takes significant care to align itself with viable business partners around the world. Kenneth D. Cole founded Kenneth Cole Productions in 1982, and today is the Company's Chairman, Interim Chief Executive Officer and Chief Creative Officer. The Company's success is largely attributed to Mr. Cole's creative vision, from footwear, fashion and accessory design, to his marketing and advertising prowess. He remains actively involved in driving the creative vision of the Company, including the design of all product categories and brands. In 2009, Mr. Cole hired the Company's first Creative Director to oversee product design on a daily basis, including managing a team of in-house designers as well as directing external licensees. Reporting into Mr. Cole, the Company's Creative Director is charged with creating compelling and cohesive lifestyle collections for modern men and women that satisfy their wardrobing needs from day-to-night and work-to-weekend. Great product is essential to the Company's success. The Company's design team dedicates time to monitoring fashion trends to ensure the collections are always modern and relevant. Select members of the design team travel globally to assess fashion trends in Europe, the United States and Asia, while searching for new inspiration. The team also partners with the internal merchandising team and external retail partners to stay aware of constantly shifting consumer preferences. In order to reduce the impact of changes in fashion trends on the Company's product sales and to increase the Company's profitability, the Company modified its product assortments to provide a more balanced mix of core and fashion items. The Company shifted its assortment strategy so that core product is now roughly half of the mix. It also introduced a number of products to address more casual wear occasions and initiated good, better, best pricing tiers to capture opening price points while maintaining high fashion content at the top of the pyramid. With a greater assortment of core, season-less styles the Company is able to capitalize on retailers' strategies to maintain and reorder these styles throughout the year, primarily through electronic data interchange ("EDI"). Product innovation has also been a key area of focus for the Company. The Company has been reinventing its business classification by classification, with the first major initiative being the re-launch of Kenneth Cole New York ladies footwear, featuring its patented "9-2-5" comfort technology. The Company re-engineered the comfort technology from its Gentle Souls footwear brand into attractive high-heeled shoes, which is a classification of women's footwear that until now has never been able to be made truly comfortable. This re-launch has generated excitement across the entire business. The Company does not own or operate any manufacturing facilities. Instead, it sources its branded and private label products directly or indirectly through independently-owned manufacturers primarily in Italy and China, among other European and Asian locations. The Company maintains an office in Dongguan, China and has long-standing relationships with several independent buying agents to monitor the production, quality and timely distribution of the Company's products from its manufacturers. In 2009, the Company hired a Chief Supply Chain Officer to oversee these operations while focusing on cost-effective sourcing, quality, margin and speed-to-market initiatives. The Company believes it has sufficient manufacturing sources available to meet its current and future production requirements in the event the Company is required to change current manufacturers or current manufacturers are unavailable to fulfill the Company's production needs however, there can be no assurance that, in the event the Company is required to change its current manufacturers, alternative suppliers will be available on terms comparable to the Company's existing arrangements. In advance of the fall and spring selling seasons, the Company works with its manufacturers to develop product prototypes for industry tradeshows. During this process, the Company works with the manufacturers to determine production costs, materials, break-even quantities and component requirements for new styles. Based on indications from the tradeshows and initial purchasing commitments from wholesalers, the Company will place production orders with the manufacturers. In addition, the Company has initiated a "test and react," program whereby prototypes are rushed to its own retail stores immediately after completion to determine initial consumer response and purchase behavior. Successful styles are used to adjust factory production and line development prior to initial season shipping. As a result of the need to maintain in-stock inventory positions, the Company places manufacturing orders for open stock and certain fashion products prior to receiving firm commitments from its customers. Once an order has been placed, the manufacturing and delivery time ranges from three weeks to four months depending on whether the product is new or is currently in production. Throughout the production process, the Company monitors product quality through inspections at both the factories and upon receipt at its warehouses. To control inventory levels, the Company monitors sell-through data on a weekly basis and seeks input on product demand from wholesale customers and its retail stores to adjust production as needed. Please refer to Footnote 15 for the Company's concentration risk. The Company believes that marketing and advertising have been integral in establishing the Kenneth Cole brand for almost three decades, and are an essential part of its long-term growth strategy. The Company also believes that its advertising campaigns have differentiated and enhanced the brands, and that its unique social voice has brought the Company global recognition for its timely focus on current events and social issues. In 2010, the Company's campaigns continued to evolve to more clearly communicate its fashion identity while retaining its unique social voice. Over the past couple of years the campaigns have become aspirational and fashion focused, featuring a selection of stylish products for men and women that broaden the Company's lifestyle appeal. The Company believes the creative concepts clearly depict its position as the quintessential metropolitan lifestyle brand for modern men and women who are confident, clever and cool. To best reach today's sophisticated audience, the Company employs a comprehensive marketing strategy, including a strong focus on media, public relations and channel marketing. The Company's media strategy includes a traditional print and outdoor advertising plan as well as a strong focus on digital and social media initiatives. The year 2010 marked the brand's foray into mobile commerce and mobile marketing, as well as an intensified focus on social networking through the Kenneth Cole Facebook and Twitter communities, which continue to actively engage a rapidly growing group of followers and strengthen the Company's connection with its consumer. In addition, the Company believes public relations programs including feature stories, fashion editorial, blogger coverage, special events, and personal appearances by Kenneth D. Cole further enhance the Company's brand awareness and equity. across all channels, geographies, and media, which it believes has been instrumental in capturing greater share of mind. As a result of these efforts, the Company believes that there is a more unified focus, strong synergy and consistency in all of the Company's communications. An additional aspect of the Company's marketing efforts is the creation and placement of branded enhancements and shop-in-shops in key department and specialty store locations. These focus areas are achieved through the placement of branded fixtures, point of purchase displays, logos and graphics, and create an environment that is consistent with the Company's image. In 2010 the Company rolled out 210 new shop-in-shops for the launch of the Reaction men's sportswear brand at Macy's locations across the country and plans to expand shop-in-shops to 350. The Company believes that these in-store enhancements enable the retailer to display and stock a greater volume of the Company's products per square foot of retail space, and encourage longer-term commitment by retailers to the Company's products while heightening consumer brand awareness. Another important component of the Company's marketing strategy is Awearness, the Kenneth Cole Foundation. Heavily promoted in 2008 with the publication of the "Awearness" book, Awearness, the Kenneth Cole Foundation is a philanthropic, not-for-profit entity that raises awareness, increases prevention, supports education and eradicates stigma in the fight against HIV/AIDS. The Company believes the initiative differentiates and enhances the Kenneth Cole brand, while heightening awareness of the Company, its brands, products and social issues. To facilitate distribution, the Company's products are inspected, bar coded, packed and shipped from manufacturers by ocean or air to the Company's distribution facilities located in the United States and Canada. The Company utilizes fully-integrated information systems and bar code technology to facilitate the receipt, processing and distribution of products through third-party warehouse distribution centers. The products are then shipped to the Company's wholesale and direct customers either in predetermined sizes, in case packs or under its open stock program. The Company's open stock program allows its wholesale customers to reorder, typically via EDI, core basic styles in a range of colors and sizes as well as many fashion styles, for immediate shipment. While the open stock program requires an increased investment in inventories, the Company believes this program is an important service for its wholesale customers by allowing them to manage inventory levels more effectively. The Company expects that affording customers improved flexibility in ordering specific stock keeping units ("SKUs") in smaller quantities will ultimately reduce the incidence of markdowns and allowances. The Company has capitalized on its centralized distribution facilities to provide additional support to its retail store operations on daily shipments of footwear, handbags and apparel to improve speed to market. The Company's EDI program is also used to re-supply its retail stores on a variety of products, thereby enhancing its service to the Company's retail operations through improved inventory management and customer response. To facilitate distribution, the Company has third-party public warehouses located on both the east and west coasts of the United States, as well as in Canada, to accommodate merchandise imported from Asia, Europe and South America. The Company uses a third-party internet service provider to handle distribution and warehousing as part of the fulfillment agreement, while the Company supplies merchandise to the provider based on customer demand. The Company believes that sophisticated information systems are essential to maintain its competitive position and to support continued growth. The Company's management information systems were designed to provide, among other things, comprehensive order processing, production, accounting and management information for the sourcing, importing, distribution and marketing aspects of the Company's business. The Company continues to update and enhance its distribution and financial systems with newer technology that offers greater functionality and reporting capabilities. The Company also utilizes an EDI system that provides a computer link between the Company and many of its wholesale customers, as well as its retail operations, that enable the Company to receive online orders and to accumulate sales information on its products shipped to its wholesale customers, retail stores and internet customers. The Company's EDI system also improves the efficiency of responding to customer needs and allows both the customer and the Company to monitor purchases, shipments and invoicing. In its retail stores, the Company uses point-of-sale registers to capture sales data, track inventories, monitor traffic and generate EDI replenishment orders. The Company regularly evaluates the adequacy of its information technologies and upgrades such systems to support its growth. The Company has an integrated business platform across the Company's full-priced retail stores and outlet stores. The Company believes that continuous upgrading and enhancements to its management information systems to support growth and expansion, in both its internal systems and in systems of third parties, is vital in protecting the Company's financial condition and its operations. In 2008, the Company outsourced website responsibilities, customer care, and fulfillment to GSI Commerce Inc. ("GSI"). The GSI e-commerce platform improved functionality and was interfaced with the Company's retail store system. The Company, through its wholly-owned subsidiary, Kenneth Cole Productions (LIC), LLC, owns federal registrations for its principal trademarks Kenneth Cole, Kenneth Cole New York, Kenneth Cole Reaction, Reaction, and Unlisted as well as several other ancillary and derivative trademarks. Also, the subsidiary owns the Le Tigre trademark and other intellectual property associated with the Le Tigre brand and the Gentle Souls trademark, patent, certain other trade secrets and proprietary processes, and other intellectual property associated with the Gentle Souls brand. Each of the federal registrations is currently in full force and effect. In addition, the Company has several federal applications pending in the United States Patent and Trademark office for trademarks and service marks. Moreover, the Company continues to expand its current international registrations in numerous countries throughout the world. The Company regards its trademarks and other proprietary rights as valuable assets in the marketing and distribution of its products, and fully intends to maintain, renew and protect the registrations, where appropriate and consistent with pertinent law, as well as vigorously defend all of its trademarks against infringements. Competition in the footwear, handbag and apparel industries is intense and these product classifications are subject to rapidly changing consumer demands. The Company competes with numerous designers, brands and manufacturers of footwear, handbags, apparel and accessories, some of which are larger, have achieved greater recognition for their brand names, have captured greater market share and/or have substantially greater financial, distribution, marketing and other resources than the Company. The Company also competes for the limited shelf-space available for the display of its products to consumers, and the Company's licensed apparel and accessories also compete with a substantial number of designer and non-designer brands. Moreover, the general availability of contract manufacturing capacity allows access by new market entrants. The Company believes the success of its business depends on its ability to stimulate and respond to changing consumer preferences by producing innovative and attractive products, brands and marketing, while remaining competitive in quality and price. The Company's business is subject to the risks of doing business abroad, such as fluctuations in currency exchange rates, local market conditions, labor unrest, political instability, actions of a public enemy, military or other government intervention, priorities, restrictions or allocations and the imposition of additional regulations relating to imports, including quotas, duties or taxes and other charges on imports. There can be no assurance that these factors will not have a material adverse effect on the Company's operations in the future. In order to reduce the risk of exchange rate fluctuations, the Company may enter into forward exchange contracts to protect the future purchase price of inventory denominated in foreign currencies. These foreign currency forward exchange contracts are used to reduce the Company's exposure to changes in foreign exchange rates and are not held for the purpose of trading or speculation. Although most of the goods sourced by the Company are not currently subject to quotas, countries in which the Company's products are manufactured may, from time to time, impose new or adjust prevailing quotas or other restrictions on exported products. In addition, the United States may impose new duties, tariffs and other restrictions on imported products, any of which could have a material adverse effect on the Company's operations and its ability to import its products at current or increased quantity levels. In accordance with the Harmonized Tariff Schedule, a fixed duty structure in effect for the United States, the Company pays import duties on its products. The majority of its products have import duties that primarily fall within a range of approximately 6% to 37.5%, depending on the category and the principal component of the product. Other restrictions on the importation of footwear, apparel, and other products are periodically considered by the United States government and no assurance can be given that tariffs or duties on the Company's goods may not be raised, resulting in higher costs to the Company, or that import quotas restricting such goods may not be imposed or made more restrictive. The Company's products are marketed primarily for fall and spring seasons, with slightly higher volume of wholesale products sold during the first and third quarters. The Company's retail business follows the general seasonal trends that are characteristic of the retail industry, with sales and earnings highest in the fourth quarter and weakest in the first quarter. Because the timing of wholesale shipments of products for any season may vary from year to year and retail's highest sales and earnings are in the fourth quarter, the results for any one quarter may not be indicative of the results for the full year. The Company's department store customers include major United States retailers, several of which are under common ownership. In 2010 and 2009, the Company had no customer or group under common ownership account for more than 10% of consolidated sales. The Company's ten largest customers represented 34.3% and 36.7% of the Company's net sales for the years ended December 31, 2010 and 2009, respectively. The Company had unfilled wholesale customer orders through the end of the second quarter of $62.0 million and $52.0 million as of March 2, 2011 and 2010, respectively. The Company's backlog at a particular time is affected by a number of factors, including seasonality, timing of market weeks and wholesale customer purchases of its core products through the Company's open stock program. Accordingly, a comparison of backlog from period to period may not be indicative of eventual shipments. The Company's chargebacks for deductions taken by its customers for returns, discounts and allowances as well as potential future customer deductions is significant to its operations. The Company reserves against known chargebacks as well as potential future customer deductions based on a combination of historical activity and current market conditions. Actual results may differ from these estimates under different assumptions or conditions, which may have a significant impact on the Company's results. At December 31, 2010, the Company had approximately 1,800 employees (which include approximately 1,100 part-time employees), none of whom are covered under a collective bargaining agreement. The Company considers its relationship with its employees to be satisfactory. Kenneth D. Cole has served as the Company's Chairman of the Board since its inception in 1982 and was also President until February 2002 and Chief Executive Officer until May 2008. As of February 28, 2011, Mr. Cole became the Company's Interim Chief Executive Officer. Prior to founding Kenneth Cole Productions, Inc., Mr. Cole was a founder and, from 1976 through 1982, a senior executive of El Greco, Inc., a shoe manufacturing and design company which manufactured Candies women's shoes. Mr. Cole is the Chairman of the Board of Directors of the Foundation for AIDS Research ("amfAR"). In addition, he is on the Board of Trustees of the Sundance Institute and the Council of Fashion Designers of America. Jill Granoff served as the Company's Chief Executive Officer from May 2008 until her departure on February 28, 2011. Ms. Granoff was previously Executive Vice President of Liz Claiborne Inc. ("Liz Claiborne") where she had global responsibility for Juicy Couture, Lucky Brand Jeans, Kate Spade and its Outlet and E-Commerce businesses. Prior to joining Liz Claiborne, Ms. Granoff was President and Chief Operating Officer of Victoria Secret Beauty, a division of Limited Brands, where she worked from 1999 to 2006. From 1990 to 1999, Ms. Granoff held various executive positions at The Estee Lauder Companies. Ms. Granoff is a member of the Board of Governors of Cosmetic Executive Women and The Women's Forum. David P. Edelman was appointed as the Chief Financial Officer in July 2004. He joined the Company in January 1995 and served as the Company's Senior Vice President of Finance since April 2000. Before joining the Company, Mr. Edelman was Chief Financial Officer of a women's suit wholesaler, and he was employed for 10 years as a Certified Public Accountant with Ernst & Young ("E&Y") in various specialty groups including E&Y's National Consulting Office and its Retail and Apparel Audit Group. Mr. Edelman serves on the Board of Directors of the American Apparel and Footwear Association. Michael F. Colosi has been the Company's Senior Vice President, General Counsel and Corporate Secretary since March 2007. Mr. Colosi previously served as Corporate Vice President and General Counsel for the Company from July 2000 to February 2007 and as Corporate Secretary since July 2004. Prior to joining the Company, Mr. Colosi was the Associate General Counsel and Assistant Secretary for The Warnaco Group, Inc. from 1996 to 2000. After clerking for Judge J. Edward Lumbard of the U.S. Court of Appeals for the Second Circuit, he was associated with major law firms from 1992 to 1996. Peter J. Charles joined the Company as its Chief Supply Chain Officer in August 2009. Mr. Charles was previously Executive Vice President of Sourcing and Production at The Nine West Footwear Group where he was responsible for a portfolio of over 15 brands such as Nine West, Anne Klein, Enzo Angiolini, Joan and David and 9&Co. Prior to The Nine West Footwear Group, Mr. Charles spent eight years at The Striderite Corporation in the role of Senior Vice President and General Manager for Striderite Sourcing International. Prior to The Striderite Corporation, Mr. Charles worked for The Timberland Company in the role of Vice President of Footwear Sourcing. From 1985 to 1996, Mr. Charles held various leadership positions at Clarks Shoes. Michael DeVirgilio was named President of Licensing and International in February 2009. Mr. DeVirgilio previously served as Executive Vice President of Business Development from January 2006 to February 2009. He served as Senior Vice President of Licensing from May 2005 to January 2006. Prior to that, he served as Corporate Vice President of Licensing and Design Services from March 2002 to May 2005. From 1999 to 2001, Mr. DeVirgilio served as Divisional Vice President of Licensing. Mr. DeVirgilio joined the Company as Director of Licensing in 1997. Prior to joining the Company, Mr. DeVirgilio was Director of Merchandising for the Joseph & Feiss Company (a division of Hugo Boss, USA). Danesha Dixon Smith joined the Company as Senior Vice President of Human Resources in October 2008. She previously worked at Liz Claiborne, Inc. in positions of increasing responsibility culminating in her appointment as Senior Vice President, Human Resources. From April 2005 to April 2007, Ms. Smith was the Vice President of Human Resources at Cendant Corporation where she worked in the company's real estate division. Ms. Smith also held numerous leadership positions at the Home Depot. Kristen Dykstra joined the Company as Senior Vice President, Chief Marketing Officer in August 2008. Ms. Dykstra was previously employed by BCBG Max Azria Group, Inc. from October 1997 to July 2008, where she most recently served as Senior Vice President of Global Marketing and Public Relations. Prior to BCBG, Ms. Dykstra worked at various public relations and advertising agencies including Orsi Public Relations and Lord Dentsu & Partners, a division of Young & Rubicam. Carol Massoni joined the Company as President of Consumer Direct in February 2011. Ms. Massoni most recently served as Senior Vice President, Merchandising and Operations at Li & Fung USA with responsibility for footwear design, merchandising, pricing, sourcing and production. Prior to Li & Fung USA, Ms. Massoni worked at Nine West Group for nearly 13 years where she most recently served as President of Jones Retail Corporation. In that role, Ms. Massoni successfully operated nine different retail concepts as well as three web businesses. Ms. Massoni had responsibility for over 1,100 stores and was instrumental in building the retail business to over $800 million in sales. Ms. Massoni began her career in the Macy's Executive Training Program, which culminated in numerous roles at Macy's in both merchandising and operations. Chris Nakatani joined the Company as President of Wholesale in March 2009. Mr. Nakatani was most recently employed with Perry Ellis International where he was the Corporate EVP Strategic Planning, responsible for three separate wholesale divisions. From 1998 to 2006, Mr. Nakatani was employed by Tommy Hilfiger in roles of increasing responsibility including his last position as President of Sales & Planning. Prior to Tommy Hilfiger, Mr. Nakatani was employed by Polo Ralph Lauren from 1989 to 1998 where he served in roles of increasing responsibility including those in sales and merchandising. He started his career at Nordstrom. Ingo Wilts joined the Company as its Senior Vice President, Creative Director in August 2009. Mr. Wilts was most recently employed with Hugo Boss, where he spent nine years in roles of increasing responsibility. He was most recently the SVP, Creative Director for BOSS Black, BOSS Green, and the luxury brand BOSS Selection. Mr. Wilts had oversight responsibility for all men's and women's product categories, including apparel, footwear, and accessories. In addition, he oversaw all brand image efforts for all channels of communication and store visual merchandising. Prior to joining Hugo Boss, Mr. Wilts was the Designer of men's sportswear at Joop!. He has additionally held various design positions at Miltenberger where he worked on the Lagerfeld and Daniel Hecter brands. Michael J. Blitzer is a Principal of Portsmouth Partners, LLC, an advisory firm that provides operational and strategic services to private equity groups that focus on retail, wholesale and consumer industries since 2005. Previously, Mr. Blitzer served as the Vice Chairman of Phillips-Van Heusen Corporation from September 1997 until he retired in November 2002. Mr. Blitzer spent over 30 years at Phillips-Van Heusen Corporation and at Macy's in various executive merchandising positions in Women's and Menswear, Accessories and Footwear. Mr. Blitzer has also worked with a variety of companies in both apparel and accessories including Neiman Marcus Group and Liz Claiborne Inc. He has served as an Operating Partner with Goode Partners LLC, a New York based, private equity firm, specializing in consumer industries including retail, restaurants and entertainment. Mr. Blitzer has served on the boards of Kate Spade, LLC, Charlotte Russe Holdings, Inc. and LeSportsac Inc. and currently serves on the boards of Charming Shoppes, Inc., Intermix LLC, and Modell's Sporting Goods. Martin E. Franklin has served as the Chairman and Chief Executive Officer of Jarden Corporation since 2001. Previously Mr. Franklin served as Executive Chairman of Bollé Inc. from 1997 to 2000. He also held the position of Chairman and CEO of Lumen Technologies, Inc. from 1996 to 1998, and its predecessor, Benson Eyecare Corporation, from 1992 to 1996. Mr. Franklin has served as the Chairman of Liberty Acquisitions Holdings, Corp from 2007 to 2010, prior to its acquisition of the Phoenix Group. He also served on the Board of Directors of GLG Partners, Inc from 2007 to 2010. Mr. Franklin currently serves as a Director of GRUPO Prisa. to Tommy Hilfiger Corp., a wholesaler and retailer of men's sportswear and boyswear, and later accepted titles of Chairman of Tommy Hilfiger Retail, Inc. and Vice Chairman of Tommy Hilfiger Corp. From 1970 to 1992, Mr. Grayson served in various capacities for Limited Inc., including President and CEO of Lerner New York from 1985 to 1992, and President and CEO of Limited Stores from 1982 to 1985. He has served as a director of Ann Taylor, Sunglass Hut and Tommy Hilfiger. He currently serves as a director of St. John Knits, Lillian August Inc. and U-Food. Denis F. Kelly is a Managing Partner at Scura Partners Securities LLC, a private investment banking firm. From 1993 to 2000, he was a Managing Director of Prudential Securities Inc. Previously, he served as the President of Denbrook Capital Corporation, a merchant banking firm, from 1991 to 1993. From 1980 to 1991, Mr. Kelly held various positions at Merrill Lynch, including Managing Director of Mergers & Acquisitions and Managing Director of Merchant Banking. Mr. Kelly began his investment banking career at Lehman Brothers in 1974. Mr. Kelly is also on the Board of MSC Industrial Direct Co., Inc., a director of Plymouth Financial Company, Inc., and Chairman of the Board of Directors of Ashburn Hill Corporation. Philip R. Peller was employed by Arthur Andersen LLP for 39 years. Prior to his retirement from Arthur Andersen in 1999, he served as Managing Partner of Practice Protection and Partner Matters for Andersen Worldwide SC, the coordinating entity for the activities of Arthur Andersen and Andersen Consulting, from 1996 to 1999. Prior to that appointment, Mr. Peller served as the Managing Director - Quality, Risk Management and Professional Competence for the worldwide audit practice. Mr. Peller joined Arthur Andersen in 1960 and was promoted to Audit Partner in 1970. Mr. Peller is a Certified Public Accountant. Mr. Peller is currently a member of the Board of Directors and Chair of the Audit Committee of MSC Industrial Direct Co., Inc. The Company files its annual, quarterly and current reports and other information with the SEC. The certifications required under Section 302 of the Sarbanes-Oxley Act of 2002 are filed as exhibits to the annual and quarterly reports on Form 10-K and Form 10-Q, respectively. In addition, the Company has provided the annual certification to the New York Stock Exchange. The Company's annual reports on Form 10-K, quarterly reports on Form 10-Q, current reports on Form 8-K and amendments to those reports filed or furnished pursuant to Section 13(a) or 15(d) of the Exchange Act are available free of charge in the "Investors" section under the subheading "Corporate Info" on the Company's website, www.kennethcole.com. These reports, and any amendments to these reports, are made available on the Company's website as soon as reasonably practicable after such reports are filed with or furnished to the SEC. The public may read and copy any materials filed by the Company with the SEC at the SEC's Public Reference Room at 100 F Street, NE, Washington, DC 20549. The public may also obtain information on the operation of the Public Reference Room by calling the SEC at 1-800-SEC-0330. In addition, the SEC maintains an Internet site that contains reports, proxy and information statements and other information regarding the Company, which is available at www.sec.gov. In addition, the Company's website, www.kennethcole.com, includes, free of charge, items related to corporate governance matters, including the Company's Corporate Governance Guidelines, charters of various committees of the Company's Board of Directors and the Company's Code of Business Conduct and Ethics applicable to employees, officers and directors. A printed copy of the Company's Form 10-K, Corporate Governance Guidelines and Code of Business Conduct and Ethics is available without charge by sending a written request to: Investor Relations, Kenneth Cole Productions, Inc., 400 Plaza Drive, 3rd Floor, Secaucus, NJ 07094. The Company operates in a changing environment that involves numerous known risks and uncertainties that could materially adversely affect its operations. The risks described below highlight some of the factors that have affected and in the future could affect the Company's operations. Additional risks that the Company does not yet know of or that it currently thinks are immaterial may also affect business operations. If any of the events or circumstances described below actually occurs, the Company's business, financial condition or results of operations could be materially adversely impacted. The Company may not be able to respond to changing fashion and consumer demands in a timely manner. business and prospects. The Company intends to market additional lines of footwear, apparel and fashion accessories in the future. As is typical with new products, demand and market acceptance for any new products introduced by the Company will be subject to uncertainty. Achieving market acceptance for each of these products may require substantial marketing efforts and the expenditure of significant funds to create customer demand. There can be no assurance that the Company's marketing effort will successfully generate sales or that the Company will have the funds necessary to undertake such an effort. The success of the Company's business depends on its ability to attract and retain key employees. The Company is heavily dependent on its current executive officers and management. The loss of any of its executive officers or management, including but not limited to, Kenneth D. Cole, or the inability to attract and retain qualified personnel could delay the development and introduction of new products, harm the Company's ability to sell products, damage the image of its brands and/or prevent the Company from executing its business strategy. The Company's business is subject to risks associated with sourcing outside the United States. Substantially all of the Company's products are produced by independent manufacturers. The Company faces the risk that these third-party manufacturers with whom it contracts to produce its products may not produce and deliver its products on a timely basis, or at all. The Company cannot be certain that it will not experience operational difficulties with its manufacturers, such as reductions in the availability of production capacity, errors in complying with product specifications, insufficient quality control, and failures to meet production deadlines or increases in manufacturing costs. The failure of any manufacturer to perform to the Company's expectations could result in supply shortages for certain products and harm its business. In addition, the Company's foreign manufacturers may be adversely affected by additional factors such as political instability in countries where contractors and suppliers are located, imposition of regulations and quotas relating to imports, imposition of duties, taxes and other charges on imports, significant fluctuation of the value of the dollar against foreign currencies and restrictions on the transfer of funds to or from foreign countries. The capacity of the Company's manufacturers to manufacture its products also is dependent, in part, upon the availability of raw materials. The Company's manufacturers may experience shortages of raw materials, which could result in delays in deliveries of the Company's products by its manufacturers or in increased costs to the Company. Any shortage of raw materials or inability of a manufacturer to manufacture or ship its products in a timely manner, or at all, could impair the Company's ability to ship orders of its products in a cost-efficient, timely manner and could cause the Company to miss the delivery requirements of its customers. As a result, the Company could experience cancellations of orders, refusals to accept deliveries or reductions in its prices and margins, any of which could harm the Company's financial performance and results of operations. The Company relies on third parties for distribution and warehousing. The Company relies on warehousing and distribution facilities operated by third parties in California, New Jersey and Ontario, Canada. Any damage at any of these facilities due to fire, earthquake, flood, terrorist attack or any other natural or man-made cause, including operational or financial hardship of the provider or its capacity, could impair a portion of the Company's inventory or its ability to use its warehousing and distribution facilities. Implementation of management information systems may impact the Company's financial results. The Company utilizes information management software in its retail operations and may consider further expansion of the software as an entity-wide integrated system solution. If any further implementation of SAP or new system enhancements is initiated, delays or computer and operational complications in connection with such implementation, could have a material adverse effect on the Company's business, financial condition or results of operations. Difficulties migrating existing systems to any new software or enhancements could impact the Company's ability to design, produce and ship its products on a timely basis. Seasonality of the Company's business and the timing of store openings and closings could result in fluctuations in its financial performance. The Company's business is subject to seasonal fluctuations. Historically, fourth quarter sales are typically higher due to holiday business. Therefore, results of operations for any single quarter are not necessarily indicative of the results that may be achieved for a full fiscal year. Quarterly results have been, and in the future will continue to be, significantly impacted by the timing of new store openings and their respective pre-opening costs, as well as store closings and related costs. In 2009, the financial results of the Company were significantly impacted by the severe deterioration of the economy which negatively impacted the full year results in 2009. Adverse publicity could negatively affect public perception of the brand. The Company's results could be substantially affected by adverse publicity resulting from its products or its advertising. Expiration of leases could result in fluctuations in the Company's financial performance. As retail store leases expire, the Company may not be able to renew them on acceptable terms or secure suitable replacement locations. While the Company continues to explore new markets and is always evaluating new potential locations, some stores may close, and this may have an adverse impact on the financial operations of the Company's Consumer Direct division. The Company cannot assure the successful implementation of its long-term strategic plan. The Company's strategy involves the expansion of the Company's retail stores. The risks associated with that strategy are detailed above under the heading "The Company's expectations of growth anticipate new store openings which are subject to many factors beyond its control." The Company has strategically taken back its women's sportswear business in-house from its licensee effective June 1, 2011. There can be no assurances that the Company can transition the business to continue the revenue stream and profitability from its former licensee. The risks associated from its licensee strategy are also detailed above under the heading "The Company relies on licensees for revenues, supply of products and compliance with Company standards." As part of the Company's strategic plan, it designated certain brands for strategic review, which includes the possible consolidation of certain lines into other brands or the licensure of brands to third parties. There can be no assurances that the Company will identify the appropriate brands for strategic review or that the measures the Company takes with respect to those brands will yield the intended results. Part of the Company's strategic plan is the growth of the Le Tigre brand. The growth of that brand cannot be assured. In 2007, the Company signed a two and a half year agreement with JC Penney to relaunch the Le Tigre brand at JC Penney. The Company and JC Penney mutually agreed not to renew the agreement upon expiration in July 2010. The ability of the Company to execute new or expanding licensee or distribution agreements domestically and abroad for the brand, as well as ongoing economic uncertainty, may negatively impact 2011 and beyond. Additionally, the growth of the brand abroad may be challenged by difficulties procuring the necessary trademarks and proprietary rights. The Company has previously announced structural realignment measures and other initiatives designed to yield substantial cost savings. There can be no assurances that the Company can successfully execute these measures or that they will produce the anticipated cost savings. The Company lacks the distribution channels abroad that it has in the U.S., and it may have difficulty developing successful distribution strategies and alliances in each of the major countries that it has targeted for significant international growth. Additionally, macroeconomic trends may continue to be extremely difficult, and could limit the Company's ability to implement its growth strategies in select geographies. The Company's sales are influenced by general economic cycles and the current economic situation. Footwear, apparel and accessories are cyclical industries dependent upon the overall level of consumer spending. The Company's wholesale customers may anticipate and respond to adverse changes in economic conditions and uncertainty by reducing inventories and canceling orders. As a result, any of the following could reduce the Company's sales and adversely affect its business and financial condition: continued adverse general economic conditions, consumer confidence and spending levels, consumer credit availability, global factory production, commercial real estate market conditions, or credit market conditions, or a substantial deterioration in any of these; a substantial increase in fuel and energy costs, unemployment, or interest rates; and any adverse acts of nature or political events. and the inability or failure on their part to meet their payment obligations to the Company, any of which could have a material adverse effect on the Company's results of operations. Additionally, consumer demand for the Company's merchandise has been impacted by consumer confidence and other economic factors currently impacting consumer spending behavior. Furthermore, the Company derives a relatively insignificant portion of its sales from international markets, which enhances its exposure to domestic economic conditions. The footwear, apparel and accessory industries are highly competitive. Any increased competition could result in reduced sales or margins. Competition in the footwear, apparel and accessory industries is intense. The Company's products compete with other branded products within their product categories as well as with private label products sold by retailers, including some of the Company's customers. To varying degrees, depending on the product category involved, the Company competes on the basis of style, price, quality, comfort and brand prestige and recognition, among other considerations. The Company also competes with numerous manufacturers, importers and distributors of footwear, apparel and accessories for the limited shelf space available for the display of such products to the consumer. Moreover, the general availability of contract manufacturing capacity allows ease of access by new market entrants. Some of the Company's competitors are larger, have achieved greater recognition for their brand names, have captured greater market share and/or have substantially greater financial, distribution, marketing and other resources than the Company. The loss of any of the Company's largest customers could have a material adverse effect on its financial results. Although currently no customer comprises more than ten percent of the Company's customer base, should one of its larger customers be negatively impacted, it could adversely affect the Company's business. In recent years the retail industry has experienced consolidation and other ownership changes. In the future, retailers may continue to have financial problems, consolidate, undergo restructurings or reorganizations, or realign their affiliations, any of which could further increase the concentration of the Company's customers. The loss of any of the Company's largest customers, or the bankruptcy or material financial difficulty of any customer, could have a material adverse effect on its business. The Company does not have long-term contracts with any of its customers, and sales to customers generally occur on an order-by-order basis. As a result, customers can terminate their relationships with the Company at any time or under certain circumstances cancel or delay orders, which could reduce the Company's sales and adversely affect its business condition. Imposition of quotas and fluctuations in exchange rates could increase the Company's costs and impact its ability to source goods. The Company's business is subject to risks of doing business abroad, including, but not limited to, fluctuations in exchange rates and the imposition of additional regulations relating to imports, including quotas, duties, taxes and other charges on imports. In order to reduce the risk of exchange rate fluctuations, the Company may enter into forward exchange contracts to protect the purchase price under its agreements with its manufacturers or purchase products in United States dollars. The Company cannot fully anticipate all of its currency needs and, therefore, cannot fully protect against the effect of such fluctuations. Although the majority of the goods sold by the Company are not currently subject to quotas, countries in which the Company's products are manufactured may, from time to time, impose new or adjust prevailing quotas or other restrictions on exported products and the United States may impose new duties, tariffs and other restrictions on imported products, any of which could adversely affect the Company's operations and its ability to import its products at the Company's current or increased quantity levels. Other restrictions on the importation of footwear and the Company's other products are periodically considered by the United States Congress and no assurances can be given that tariffs or duties on the Company's goods may not be raised. If tariffs are raised in the future, they will result in higher costs to the Company, and if import quotas are imposed or made more restrictive, the Company may not be able to source its goods at historical factories or at similar prices. War, acts of terrorism, and natural disasters could affect the Company's ability to procure, sell and deliver product. In the event of actual or threatened war, acts of terrorism or the escalation of existing hostilities, or in the event of a natural disaster, the Company's ability to procure its products from its manufacturers for sale to its customers may be negatively affected. The Company imports a substantial portion of its products from other countries. If it becomes difficult or impossible to import the Company's products into the countries in which it sells its products, the Company's sales and profit margins may be adversely affected. Additionally, war, military responses to future international conflicts, and possible future terrorist attacks may lead to a downturn in the U.S. and/or international economies, which could have a material adverse effect on the Company's results of operations. The Company relies on licensees for revenues, supply of products and compliance with Company standards. The Company licenses its trademarks to third parties for manufacturing, marketing, distribution and sale of various products and intends to expand its licensing programs. While the Company enters into comprehensive licensing agreements with its licensees covering product design, product quality, sourcing, manufacturing, marketing and other requirements, its licensees may not comply fully with those agreements. Non-compliance could include marketing products under the Company's brand names that do not meet its quality and other requirements or engaging in manufacturing practices that do not meet the Company's supplier code of conduct. These activities could harm the Company's brand equity, its reputation and its business. In addition, the Company's royalty revenues could be affected by the results of its licensees or distributors, or the transition of any of its licensing categories in-house. The financial difficulties of any of its partners or their failure to produce and deliver acceptable product could have an adverse impact on the Company's royalty revenues in the future. In the event of a business failure of any such partner or of the breakdown of the Company's relationship with any domestic or foreign partner, there is no guarantee that the Company could replace such royalty revenues or business. Failure to anticipate and maintain proper inventory levels could have an adverse financial effect on the Company's business. The Company maintains an inventory of selected products that it anticipates will be in high demand. The Company may be unable to sell the products it ordered in advance from manufacturers or that it has in its inventory. Inventory levels in excess of customer demand may result in inventory write-downs or the sale of excess inventory at discounted or closeout prices. These events could significantly harm the Company's operating results and impair the image of the Company's brands. Conversely, if the Company underestimates consumer demand for its products or if manufacturers fail to supply quality products in a timely manner, the Company may experience inventory shortages, which may result in unfilled orders, negatively impact customer relationships, diminish brand loyalty and result in lost revenues. The Company's expectations of growth anticipate new store openings which are subject to many factors beyond its control. Future growth in sales and profits in the Company's Consumer Direct division will depend to some extent on its ability to increase the number of stores. The lease negotiation and development timeframes, and the accomplishment of other milestones on which opening new stores depend, vary from location to location and can be subject to unforeseen delays. The number and timing of new stores actually opened during any given period, and their associated contribution to net income for the period, will depend on a number of factors including, but not limited to: the identification and availability of suitable markets, locations, and leases; the negotiation of acceptable lease terms for new locations; the development of new merchandise and effective management of inventory to meet the needs of new and existing stores on a timely basis; the successful management of its infrastructure to accommodate new store openings; the fostering of current relationships and development of new relationships with vendors that are capable of supplying a greater volume of merchandise; the availability of suitable financing to the Company and its landlords; the timing of the delivery of the leased premises to the Company from its landlords in order to commence build-out construction activities; the ability of the Company and its landlords to obtain all necessary governmental licenses and permits to construct, open, and operate its stores on a timely basis; the Company's ability to manage the construction and development costs of new stores, and the availability and/or cost of raw materials; the avoidance of construction delays and cost overruns in connection with the build-out of new stores; the rectification of any unforeseen engineering or environmental problems with the leased premises; adverse weather during the construction period; and the hiring and training of qualified operating personnel in the local market. Any of the above factors could have a material adverse impact on the Company's financial condition. The Company's plans to expand its store base may not be successful and may not result in an increase in its revenues even though they increase costs. The Company will be required to enter into additional leases, increase its rental expenses and make capital expenditures for these stores. These commitments may be costly to terminate, and these investments may be difficult to recapture if the Company decides to close a store or alter its strategy. The Company must offer a broad product assortment, appropriately manage retail inventory levels, operate effective retail systems, execute effective pricing strategies and integrate its stores into its overall business mix. In addition, the opening of stores may divert some revenues from its wholesale customers. The increased demands of operating additional stores could cause the Company to operate less effectively, which could cause the performance of its existing operations to suffer materially. As a result, the Company's revenues could decline and its profitability could be adversely affected. The worldwide apparel industry is subject to ongoing pricing pressure, which could adversely affect the Company's sales and margins. retail industry, and pressure from retailers to reduce the costs of products. These factors contribute to ongoing downward pricing pressure. This pressure may require the Company to: reduce wholesale prices on existing products; reduce gross margins across the Company's product lines; and yield to increased retailer demands for allowances, incentives and other forms of economic support. If the Company's sales prices decline and the Company fails to reduce its product costs or operating expenses sufficiently, its losses could continue or grow. This could have a material adverse effect on the Company's results of operations and financial condition. The Company may experience continued contraction in its primary distribution channels. In the United States, department stores are the primary distribution channels for the Company's products. Sales through these distribution channels could constrict, or the Company may be unable to increase sales of its products through these channels, for several reasons, including, but not limited to: many of the Company's primary customers are reducing the number of stores they operate, thereby reducing the number of doors into which the Company's products can be sold; and these customers maintain - and seek to grow - substantial private-label and exclusive offerings as they strive to differentiate the brands and products they offer from those of their competitors. The ability to maintain retail floor space, market share and sales in these channels depends on the Company's ability to offer differentiated and exclusive products and to increase retailer profitability on its products, which could have an adverse impact on the Company's margins. The Company could suffer if one of its manufacturers fails to use acceptable labor practices. The Company requires its independent manufacturers to operate in compliance with Company guidelines and applicable laws and regulations. While the Company's internal and vendor operating guidelines promote ethical business practices, the Company does not control these manufacturers or their labor practices. The violation of labor or other laws by an independent manufacturer used by the Company, or the divergence of an independent manufacturer's labor practices from those generally accepted as ethical or appropriate in the U.S., could interrupt, or otherwise disrupt, the shipment of finished products to the Company or damage its reputation. Any of these, in turn, could have a material adverse effect on the Company's financial condition and results of operations. If the Company fails to maintain the value of its brands, its sales are likely to decline. The Company's success depends on the value of its brands. The brands under which the Company sells products are integral to its business as well as to the implementation of its strategies for expanding its business. Maintaining, promoting, and positioning the Company's brands will depend largely on the success of its marketing and merchandising efforts and its ability to provide a consistent, high quality customer experience. Its brands could be adversely affected if it fails to achieve these objectives or if its public image or reputation were to be tarnished by negative publicity or consumer perception. Any of these events could result in decreases in sales. The Company's inability to maintain levels of comparable store sales could cause earnings to decline. If the Company's future comparable store sales fail to meet market expectations, losses could occur. A variety of factors affect comparable store sales, including fashion trends, competition, current economic conditions, pricing, inflation, the timing of the release of new merchandise and promotional events, changes in merchandise mix, the success of marketing programs, timing and level of markdowns and weather conditions. These factors may cause comparable store sales results to be materially lower than recent periods or expectations, which could cause declines in quarterly earnings and stock price. A reduction in the volume of traffic to the Company's stores could significantly reduce sales and leave the Company with unsold inventory. The Company's stores are located in premiere shopping districts and shopping malls. Sales at these stores are derived, in part, from the volume of traffic in those areas. The Company's mall stores benefit from the ability of the malls' "anchor" tenants, generally large department stores, and other area attractions to generate consumer traffic in the vicinity of its stores and the continuing popularity of the malls as shopping destinations. Sales volume and traffic at mall stores could continue to be adversely affected by economic downturns, the closing of anchor department stores and competition from non-mall retailers and other malls where the Company does not have stores. Any of these events, or a decline in the desirability of the shopping environment of a particular mall or area or in the popularity of shopping generally among the Company's customers, would adversely affect the Company's results. The inability to renew certain of the Company's licenses, or to do so on terms that are favorable to the Company, could have a material adverse effect on its financial results. wish to extend the term of the license. There is no guarantee that the Company and its partners will reach mutually agreeable terms for extending a licensing relationship. Similarly, in those instances where a licensee enjoys the option to extend the term of a license as a result of having achieved certain conditions, there is no guarantee that the licensee will avail itself of such option. The Company's financial results could be adversely affected if the Company is unable to extend a license agreement, if it is unable to do so on terms favorable to the Company, or it if it cannot locate a suitable alternative to an incumbent licensee who has decided not to renew a license. Fluctuations in the price, availability and quality of the fabrics or other raw materials used to manufacture the Company's apparel, footwear and accessories could have a material adverse effect on the Company's cost of goods or the ability to meet customers' demands. The prices for such fabrics depend largely on the market prices for the raw materials used to produce them, particularly cotton, leather and synthetics. The price and availability of such raw materials may fluctuate significantly, depending on many factors, including crop yields and weather patterns. In the future, the Company may not be able to pass all or a portion of such higher raw materials prices on to the Company's customers. The voting shares of the Company's stock are concentrated in one majority shareholder. Currently, Kenneth D. Cole owns approximately 90% of the voting power and approximately 47% of the outstanding common stock of the Company. As a result, Mr. Cole has the ability to control (i) the election of all of the Company's directors other than the directors who will be elected by the holders of Class A Common Stock, voting separately as a class, and (ii) the results of all other shareholder matters. Mr. Cole's interests may differ from the interests of the other stockholders. Outcomes of litigation or changes in regulatory control could impact the Company's financial condition. From time to time, the Company may be a party to lawsuits and regulatory actions relating to its business. Due to the inherent uncertainties of litigation and regulatory proceedings, the Company cannot accurately predict the ultimate outcome of any such proceedings. An unfavorable outcome could have a material adverse impact on the Company's business, financial condition and results of operations. In addition, regardless of the outcome of any litigation or regulatory proceedings, such proceedings could result in substantial costs and may require that the Company devote substantial resources to defend itself. Further, changes in government regulations both in the United States and in the countries in which the Company operates could have adverse affects on its business and subject it to additional regulatory actions. The loss or infringement of the Company's trademarks and other proprietary rights, or its failure to procure these rights, could have a material adverse effect on its operations. The Company believes that its trademarks and other proprietary rights are important to its success and competitive position. Accordingly, the Company devotes substantial resources to the establishment and protection of its trademarks on a worldwide basis. There can be no assurances that such actions taken to establish and protect the Company's trademarks and other proprietary rights will be adequate to prevent imitation of its products by others or to prevent others from seeking to block sales of the Company's products as violative of their trademarks and proprietary rights. In addition, the laws of certain foreign countries may not protect trademarks and proprietary rights to the same extent as do the laws of the United States. During the course of the Company's expansion of its trademark portfolio, it has experienced conflicts with various third parties that have acquired or claimed ownership rights in one or more of its trademarks or otherwise have contested the Company's rights to its trademarks. The Company has in the past endeavored to resolve certain of these conflicts through both legal action and negotiated settlements. There can be no assurances that the Company will be able to resolve such conflicts successfully or that others will not assert rights in, or ownership of, the Company's trademarks and other proprietary rights. Any litigation regarding Company trademarks or other proprietary rights could be time consuming and costly, and the loss of such trademarks and other proprietary rights, or the loss of the exclusive use of such trademarks and other proprietary rights, could have a material adverse effect on the Company's operations. The effects of hurricanes and other natural disasters may increase insurance costs for which the Company may take on higher deductibles if losses occur. The Company has operations in flood, hurricane and earthquake zones. As such, the Company has insured itself against losses from natural disasters. The cost of such insurance could rise significantly as a result of the effects of future natural disasters throughout the United States. To offset such costs, the Company may take on larger deductibles which, if aggregated through multiple disaster locations, could have a material effect on its results of operations. Negative conditions in global credit markets may impair the Company's marketable securities portfolio. The Company has investments in auction-rate securities with a fair value of $2.5 million as of December 31, 2010 which reset every 28 days that are "A" through "double C" rated debt obligations, and substantially all have insurers. Continuing adverse conditions in the global credit markets have prevented some investors from liquidating their holdings of auction-rate securities because the amount of securities submitted for sale has exceeded the amount of purchase orders for such securities. If there is insufficient demand for the securities at the time of auction, the auction may not be completed and the interest rates may not be reset to predetermined interest rates. When auctions for these securities fail, the investments may not be readily convertible to cash until a future auction of these investments is successful or they are redeemed or mature. If a decline in market value continues that is deemed other-than-temporary resulting in a writedown, the result could have a material effect on the Company's results of operations. The Company's ability to collect receivables could be impacted by adverse economic conditions. A financial institution engaged by the Company collects and insures significant receivable balances. If the global credit markets or economic conditions do not improve or worsen, the Company may be exposed to potential significant write-offs that could adversely impact its financial results. In addition, challenging economic conditions may impair the ability of the Company's customers to pay for products and licensees to pay royalties. As a result, reserves for doubtful accounts and write-offs of accounts receivable may increase. The Company's corporate headquarters building is located at 603 West 50th Street, New York, New York. The building is owned by the Company and has approximately 119,000 square feet of space. The Company leases 51,000 square feet of office space in Secaucus, New Jersey for its administrative offices. The Company also has a technical and administrative office in Dongguan, China. The Company does not own or operate any manufacturing facilities. As of December 31, 2010, the Company leased space for all of its 33 full-priced retail stores (aggregating approximately 154,000 square feet) and 72 Company Stores (aggregating approximately 300,000 square feet). Generally, the leases provide for an initial term of five to ten years and certain leases provide for renewal options permitting the Company to extend the term thereafter. In addition, certain leases have co-tenancy failure options allowing the Company to terminate leases prior to contractual expiration dates based on specified terms not met by the landlord or the Company as defined by the lease. The Company is, from time to time, a party to litigation that arises in the normal course of its business operations. The Company is not presently a party to any litigation that it believes might have a material adverse effect on its business operations. The number of shareholders of record of the Company's Class A Common Stock on February 28, 2011 was 96. There were 8 holders of record of the Company's Class B Common Stock on February 28, 2011, all of which were directly or indirectly owned by Kenneth D. Cole. There is no established public trading market for the Company's Class B Common Stock. The Company did not repurchase shares during 2010 and 2009. The payment of any future dividends will be at the discretion of the Company's Board of Directors and will depend, among other things, upon future earnings, operations, capital requirements, proposed tax legislation, the financial condition of the Company and general business conditions. The Board of Directors suspended the Company's quarterly dividend on February 26, 2009. Therefore, there were no dividend payments during 2010 and 2009. The following graph compares the yearly percentage change in the cumulative total shareholder return on the Class A Common Stock during the period beginning on December 31, 2005 and ending on December 31, 2010 with the cumulative total return on the Standard & Poor's 500 Composite Index and a Peer Group. The comparison assumes that $100 was invested on December 31, 2005 in the Class A Common Stock in the foregoing indices and assumes the reinvestment of dividends. The following selected financial data has been derived from the consolidated financial statements of the Company and should be read in conjunction with the consolidated financial statements and notes thereto that appear elsewhere in this Annual Report and in "Management's Discussion and Analysis of Financial Condition and Results of Operations" set forth in Item 7 of this Annual Report. (1) Gross profit may not be comparable to other entities, since some entities include the costs related to their distribution network (warehousing and handling) in cost of goods sold and other entities, similar to the Company, exclude these costs from gross profit, including them instead in a line item such as selling, general and administrative expenses. (2) Includes warehousing and handling expenses. The following discussion and analysis should be read in conjunction with the consolidated financial statements and the notes thereto that appear elsewhere in this Annual Report. The Company markets its products to approximately 5,200 domestic department and specialty store locations, the Company's full-priced retail stores, outlet stores, and its e-commerce website, as well as internationally through its licensee partners and international retailers. The Company believes the diversity of its product offerings distinguishes the Company from its competitors in terms of product classifications (men's, women's and children's footwear, apparel and accessories), prices ("bridge", "better" and "moderate") and styling. The Company believes the diversity of its product mix provides balance to its overall sales and increases opportunities in all channels of distribution. The popularity of the Kenneth Cole brand names, including Kenneth Cole New York, Kenneth Cole Reaction and Unlisted, among consumers has enabled the Company to expand its product offerings and channels of distribution through licensing agreements. The Company offers, through these agreements, a lifestyle collection of men's product categories, including tailored clothing, dress shirts, dress pants, neckwear, outerwear, sleepwear, socks, underwear, belts, business cases, small leather goods, sunglasses, prescription eyewear, watches, jewelry and fragrance. Women's product categories currently being sold pursuant to license agreements include sportswear, outerwear, swimwear, sleepwear, small leather goods, belts, sunglasses, prescription eyewear, watches, jewelry and fragrance. In addition, the Company licenses luggage and children's apparel. In October 2010, the Company announced that it had made the strategic decision to terminate the licensing agreement with its women's sportswear licensee effective June 1, 2011, and will be bringing the business in-house starting with the Fall 2011 season. The Company recorded net revenues of $457.3 million for the year ended December 31, 2010. Diluted earnings per share were $0.11 for the year ended December 31, 2010 compared to a diluted loss per share of $(3.52) for the year ended December 31, 2009. As of December 31, 2010, the Company had $83.4 million in cash and cash equivalents up $14.9 million versus a year ago and no long-term debt. (3) Includes a $43.6 million deferred tax valuation allowance for the year ended December 31, 2009. Net revenues increased 11.4%, or $46.9 million, to $457.3 million in 2010 from $410.4 million in 2009. Revenues increased in each of the Company's segments contributing to the double-digit revenue growth. Wholesale net sales increased 8.9%, or $17.7 million, to $219.2 million in 2010 from $201.5 million in 2009. The majority of the increase was the result of the launch of Reaction men's sportswear, as well as sales growth in international markets. This increase was offset by the loss of approximately $10 million of sales from the Company's planned exit of the Bongo footwear line, which the Company exited in the third quarter of 2009, and reductions in private label programs. Net sales in the Company's Consumer Direct segment increased 13.5%, or $22.9 million, to $192.4 million for the year ended December 31, 2010 from $169.5 million for the year ended December 31, 2009. The increase was driven by a comparable store sales increase of 9.3%, or $13.4 million, and by double-digit sales growth in e-commerce. Comparable stores are defined as new stores that are open for longer than thirteen months. A store that stops operations is included in the comparable sales calculation through the date of closing. During 2010, the Company opened five outlets and one full-priced retail store and closed five outlets and six full-priced retail stores. During 2009, the Company opened nineteen outlets and closed five full-priced retail stores. Subsequent to December 31, 2010, the Company has closed an additional seven full-priced retail stores, including its Rockefeller Center location, and plans to close two additional stores in the first half of 2011. Licensing revenue increased 15.8%, or $6.3 million, to $45.7 million in 2010 from $39.4 million in 2009. The increase in licensing revenues was driven primarily by sales growth in men's categories including outerwear, dress shirts, tailored clothing and pants. In addition, growth was recorded in women's sportswear and the international markets in the United Kingdom, Latin America and Canada. Contractual minimums for the Le Tigre license with JC Penney ceased during the third quarter of 2010 as the license was not renewed through a mutual agreement. the Wholesale segment, had increased revenues, as a percentage of total net revenues, to 42.1% for the year ended December 31, 2010 compared to 41.3% for the year ended December 31, 2009. The Wholesale segment revenues, as a percentage of total net revenues, decreased to 47.9% for the year ended December 31, 2010 from 49.1% for the year ended December 31, 2009. The revenues in the Licensing segment, which carries nominal cost of goods sold, increased, as a percentage of total net revenues, to 10.0% for the year ended December 31, 2010 compared to 9.6% for the year ended December 31, 2009. Selling, general and administrative ("SG&A") expenses, including warehousing and handling expenses, as a percentage of net revenues, improved 200 basis points to 42.4% for the year ended December 31, 2010 compared to 44.4% for the year ended December 31, 2009. Total SG&A increased $11.9 million to $194.1 million for the year ended December 31, 2010 from $182.2 million for the year ended December 31, 2009. The increase in SG&A expenses versus the prior period was primarily attributable to variable shipping costs, compensation for the Company's pay-for-performance bonus incentive and $6.9 million for store closing costs and professional fees for exploring strategic alternatives. Impairments of intangible and long-lived assets were $0.3 million for the year ended December 31, 2010 and $19.3 million for the year ended December 31, 2009. Management reviewed its retail stores' fair value based upon estimated undiscounted future cash flows. Based upon this review, the Company recorded a charge of $0.3 million and $6.5 million for underperforming retail stores whose fair value was below carrying value for the years ended December 31, 2010 and 2009, respectively. In addition, impairments in 2009 included a $12.8 million charge to reduce the Le Tigre trademark to its adjusted fair value. Interest and other income, net increased $1.5 million to $2.0 million for the year ended December 31, 2010 compared to $0.5 million for the year ended December 31, 2009. The increase is primarily due to the gain on the sale of the Company's equity investments of approximately $1.7 million partially offset by lower interest rates on money market funds. Impairment of investments, which were other-than-temporary impairments of auction-rate securities, was $0.5 million for the year ended December 31, 2010 and $1.0 million for the year ended December 31, 2009. The fair value of the Company's auction-rate securities was determined utilizing an independent appraiser. The primary variables used in determining fair value include collateral, rating, insurance, credit risk and downgrade risk of the security. The Company's effective tax rate was a 30.1% provision for the year ended December 31, 2010 compared to a 103.8% provision for the year ended December 31, 2009. The change in the Company's effective tax rate is primarily the result of the additional $43.6 million valuation allowance recorded by the Company during 2009. The Company also recorded a small increase in the valuation allowance of $0.4 million for the year ended December 31, 2010. The income tax expense for 2010 is primarily taxes from state, local and foreign jurisdictions. The Company remains in a three-year cumulative loss position and continues to have a valuation allowance for primarily all of the Company's deferred tax assets. If the Company generates taxable income on a sustained basis, the need for a deferred tax asset valuation allowance could change resulting in the reversal of all or a portion of this deferred tax asset valuation allowance. As a result of the foregoing, the Company recorded net income of $2.1 million or 0.5% of net revenues for the year ended December 31, 2010 compared to a $63.2 million loss or (15.4%) of net revenues for the year ended December 31, 2009. Net revenues decreased $81.9 million, or 16.6%, to $410.4 million in 2009 from $492.3 million in 2008. The decrease was due to decreases in each of the Company's business segments. Wholesale net sales (excluding sales to the Company's Consumer Direct business segment) decreased $65.7 million, or 24.6%, to $201.5 million in 2009 from $267.2 million in 2008. The decrease was primarily a result of the Company's decision to streamline its portfolio of brands and eliminate unprofitable businesses. Over 70% of the decline was attributable to the Company's planned exit of the Tribeca and Bongo footwear lines, as well as reductions in associated private label programs and sales to the Company's off-priced customers. The remaining decline was attributable to a decrease in sales across the majority of the Company's wholesale businesses as a result of factors including retailer destocking, a challenging retail environment and continued stress in the macro-economic marketplace. Net sales in the Company's Consumer Direct segment decreased $11.9 million, or 6.6%, to $169.5 million for the year ended December 31, 2009 from $181.4 million for the year ended December 31, 2008. Sales associated with fourteen net new stores opened since the prior year was offset by a comparable store sales decrease of 12.8%, or $19.2 million. The Company chose to be less promotional in the back half of the year and therefore while its sales were down the lack of clearance activity resulted in higher percentage of full price sales and improved gross margin. Comparable stores are defined as new stores that are open for longer than thirteen months. A store that stops operations is included in the comparable sales calculation through the date of closing. During 2009, the Company opened nineteen outlets and closed five full-priced retail stores as compared to opening eleven outlets, opening two full-priced retail stores and closing eight full-priced retail stores during 2008. Royalty revenue decreased $4.3 million, or 9.9%, to $39.4 million in 2009 from $43.7 million in 2008. The decrease in royalty revenues was primarily attributable to a reduction in the recognition of contract initiation fees and a reduction in licensee sales into the off-price channel offset by improved performance in certain of its men's and women's apparel categories. Consolidated gross profit, as a percentage of net revenues, increased to 41.7% for the year ended December 31, 2009 from 40.4% for the year ended December 31, 2008. Quarterly consolidated gross profit improved quarter over quarter throughout fiscal 2009 primarily from disciplined inventory management, better sell-through and less promotion as follows: First Quarter 33.9%; Second Quarter 42.4%; Third Quarter 43.3%; Fourth Quarter 46.8%. The increase, as a percentage of net revenues for fiscal 2009, was also due to revenue mix shifting to the Consumer Direct and Licensing segments as a percentage of total revenue. The Consumer Direct segment, which operates at a higher gross profit level than the Wholesale segment, increased as a percentage of net revenues to 41.3% for the year ended December 31, 2009 compared to 36.9% for the year ended December 31, 2008, while the Wholesale segment revenues as a percentage of net revenues decreased to 49.1% for the year ended December 31, 2009 from 54.2% for the year ended December 31, 2008. The revenues in the Licensing segment, which carries nominal cost of goods sold, increased as a percentage of net revenues to 9.6% for the year ended December 31, 2009 compared to 8.9% for the year ended December 31, 2008. SG&A, inclusive of warehousing and receiving expenses, decreased $26.0 million to $182.2 million for the year ended December 31, 2009 from $208.2 million for the year ended December 31, 2008. The decrease in SG&A expenses was primarily attributable to cost reduction programs enacted during the course of the year, including various cuts in payroll and discretionary spending. As a percentage of net revenues, SG&A expenses increased to 44.4% for the year ended December 31, 2009 compared to 42.3% for the year ended December 31, 2008. While SG&A as a percentage of revenues improved in the back half of the year, over the annual period SG&A increased due to a loss of leverage and the increased concentration of the Consumer Direct Segment, which carries a higher SG&A expense level than the Wholesale and Licensing segments. Impairments of intangible and assets were $19.3 million for the year ended December 31, 2009 and $3.0 million for the year ended December 31, 2008. Impairments in 2009 included a $12.8 million charge for the Le Tigre trademark and $6.5 million for retail store long-lived assets, while 2008 included $1.9 million for retail store long-lived assets and $1.1 million for certain shop-in-shop build-out costs. In 2009, the Company opened four Le Tigre outlet stores and began expanding the Le Tigre brand internationally; however, it also reached a mutual agreement with JC Penney not to renew the exclusive license agreement for Le Tigre which prompted an impairment indicator. The Company, with the assistance of an independent appraiser, utilized a combination of the market approach and the royalty savings method under the income approach to estimate fair value. Based upon the review, the Company recorded a charge of $12.8 million for the year ended December 31, 2009. Also, management reviewed its retail stores' fair value based upon estimated undiscounted future cash flows. In 2009, the Company recorded a charge of $6.5 million for underperforming retail stores whose fair value was below carrying value. Interest and other income, net decreased $1.2 million to approximately $0.5 million for the year ended December 31, 2009 as compared to $1.7 million for the year ended December 31, 2008. The decrease is primarily due to lower interest rates as the majority of the Company's cash balances are in government money market accounts. Impairment of investments was $1.0 million for the year ended December 31, 2009 and $7.8 million for the year ended December 31, 2008. The Company recorded an other-than-temporary impairment of $1.0 million related to auction-rate securities during the year ended December 31, 2009 and recorded other-than-temporary impairments of $7.8 million, of which $4.6 million related to an investment in the common stock of one of its licensees and $3.2 million related to auction-rate securities, during the year ended December 31, 2008. The fair value of the Company's auction-rate securities was determined utilizing an independent appraiser. The primary variables used in determining fair value include collateral, rating, insurance, credit risk and downgrade risk of the security. The Company's effective tax rate was a 103.8% provision for the year ended December 31, 2009 compared to a 19.7% benefit for the year ended December 31, 2008. The change in the Company's tax rate is a result of a $43.6 million valuation allowance against the Company's deferred tax assets offset by the tax benefit from the Company's net loss. The Company analyzed both positive and negative evidence in determining the potential requirement for a valuation allowance on its deferred tax assets. The Company reviewed its results over the last three years, which resulted in a cumulative loss over such period. In accordance with income tax accounting guidance, a three-year historical cumulative loss is considered significant negative evidence and difficult to overcome in the absence of compelling positive evidence. As such, the Company recorded a valuation allowance of approximately $43.6 million for the year ended December 31, 2009. The establishment of the valuation allowance does not preclude the Company from using the net operating loss carryforwards or other deferred tax assets in the future. If the Company begins to generate taxable income on a sustained basis the need for a deferred tax asset valuation allowance will change resulting in the reversal of all or a portion of this deferred tax asset valuation allowance. As a result of the foregoing, net loss increased by $48.4 million, to $63.2 million or (15.4%) of net revenues for the year ended December 31, 2009 from $14.8 million or (3.0%) of net revenues for the year ended December 31, 2008. The net loss includes a $43.6 million valuation allowance along with $20.3 million of pre-tax asset impairments. Please refer to Footnote 17 for the Company's related party transactions disclosure. As of December 31, 2010, the Company had $83.4 million in cash and cash equivalents, which consist primarily of money market funds. The Company uses cash from operations as the primary source of financing its capital expenditures and seasonal requirements. Cash needs vary from time to time as a result of the timing of the receipt of merchandise from suppliers, the delivery by the Company of merchandise to its wholesale customers and its retail stores and the level of inventory and accounts receivable balances. At December 31, 2010 and 2009, working capital was $100.3 million and $88.6 million, respectively. Net cash provided by operating activities remained flat at $17.3 million for the years ended December 31, 2010 and 2009. An increase in net income was offset by an increase in receivables and inventory. In addition, $4.1 million of tax receipts from net operating loss carrybacks filed with the U.S. Treasury as part of government tax legislation enacted in 2009, was offset by $3.6 million of lease contract termination payments. Net cash used in investing activities totaled $1.7 million for the year ended December 31, 2010 compared to $11.8 million for the year ended December 31, 2009. The decrease was primarily attributable a $7.9 million decrease in capital expenditures as the Company opened and renovated fewer stores during the year ended December 31, 2010 compared to December 31, 2009. In addition, the Company had proceeds of $1.7 million from the sale of equity securities during the year ended December 31, 2010, while intangible asset purchases decreased $0.5 million during the year ended December 31, 2010 compared to the year ended December 31, 2009. Net cash used in financing activities was $0.7 million for the year ended December 31, 2010 compared to $1.8 million for the year ended December 31, 2009. The decrease primarily resulted from no payments for financing costs during the year ended December 31, 2010 compared to $0.7 million during the year ended December 31, 2009. In addition, dividends associated with the vesting of restricted stock decreased $0.3 million and shares surrendered for taxes on restricted stock decreased $0.1 million during the year ended December 31, 2010 as compared to the year ended December 31, 2009. Operating leases represent the minimum lease rental payments under non-cancelable leases primarily for the Company's Consumer Direct stores. The Company is also normally required to pay taxes, insurance, and occupancy costs relating to its leased Consumer Direct stores. Purchase obligations represent the Company's legally binding agreements to purchase fixed quantities of goods at determinable prices. Virtually all of these agreements are denominated in U.S. dollars and at any given time the currency risk is immaterial. The Company excluded $40.6 million of liabilities associated with its deferred compensation plan from the above contractual obligations table because the Company cannot make a reasonable estimate as to the periods during which the liabilities will be settled. The corresponding asset of $40.6 million is included within Deferred compensation plans' assets on the Consolidated Balance Sheet. In addition, $15.9 million of accrued rent and other long-term liabilities have been excluded, which is comprised of accrued rent of $13.0 million and unrecognized tax liabilities of $2.9 million. Accrued rent included on the Consolidated Balance Sheet represents the difference between straight-line rent expense and cash obligations to its landlords. The amounts for these cash payments are included in the operating lease caption disclosed in the table above. The other long-term liabilities are unrecognized tax liabilities for which the Company cannot make a reasonable estimate as to the periods during which the liabilities will be settled. Contingent rent and other charges amounted to $9.8 million and $8.5 million for the years ended December 31, 2010 and 2009, respectively. The Company has a revolving senior secured asset based credit facility (the "Facility") which provides the Company with borrowing availability of $60 million. The Facility may be increased to $85 million at the election of the Company upon meeting certain conditions, but may not exceed a borrowing base equal to a percentage of the Company's accounts receivable and inventory. The Facility terminates by its terms, and all amounts borrowed under the Facility shall be due and payable, on December 20, 2011. The Facility includes a $7.5 million sublimit for Swingline Loans and a $35 million aggregate sublimit for letters of credit, with a further sublimit of $15 million for standby letters of credit. Revolving loans under the Facility may be base rate loans or Eurodollar loans, at the Company's election. Base rate loans shall bear interest at a rate per annum equal to the sum of (i) the greatest of (a) the Prime Rate in effect on such day, (b) the Federal Funds Effective Rate in effect on such day plus ½ of 1% and (c) the Adjusted LIBO Rate for a one month Interest Period on such day plus 1%; plus (ii) 2.5%. Eurodollar loans shall bear interest at the Adjusted LIBO Rate, plus 3.5%. The Facility is secured by substantially all the assets of the Company and its domestic subsidiaries, including a pledge by the Company of its equity interest in each of its domestic subsidiaries. If availability under the Facility is less than $10,000,000, the Company will be subject to a monthly fixed charge coverage ratio. The Facility limits the Company's ability to incur indebtedness or liens, its ability to enter into mergers or sell assets, its ability to change the nature of its business, and its ability to enter into certain guarantees. In addition, the Company may not declare or pay dividends if availability under the Facility is less than $10,000,000. The Facility also contains customary events of default. Upon the occurrence of an event of default, the outstanding obligations under the Facility may be accelerated and become immediately due and payable. During 2010 and 2009, the Company incurred facility fees of approximately $0.4 million and $0.2 million respectively, and also made payments of approximately $0.7 million for financing costs related to the Facility during 2009. The Company did not borrow under the Facility during 2010 or 2009 and there were no outstanding advances under this agreement at December 31, 2010 and 2009. Amounts available under the Facility at December 31, 2010 and 2009 were reduced by $2.5 million and $1.2 million, respectively, of standby and open letters of credit. The Company had $29.0 million available to borrow as of December 31, 2010 compared to $22.8 million as of December 31, 2009. The Company believes that it will be able to satisfy its current expected cash requirements for 2011, including requirements for its new stores, anticipated store closing costs, expected enhancement of information systems and anticipated current obligations, primarily with cash flow from operations and cash on hand. The Company did not have any off-balance sheet arrangements as of December 31, 2010. The Company may use derivative instruments, typically forward contracts, to manage its risk associated with movements in foreign currency exchange rates in purchasing inventory. The Company recognizes all derivatives on the Consolidated Balance Sheets. Derivative instruments that meet certain criteria are classified as cash flow hedges, and changes in their fair value are recognized in Accumulated other comprehensive (loss)/income in the accompanying Consolidated Statements of Changes in Shareholders' Equity, until the hedged item is recognized in earnings. Those derivatives that are not classified as cash flow hedges are adjusted to fair value through earnings. The Company does not hold derivative instruments for the purpose of trading or speculation. The Company did not use any derivative instruments during 2010 or 2009. While the Company believes that its current procedures with respect to the reduction of risk associated with currency exchange rate fluctuations are adequate, there can be no assurance that such fluctuations will not have a material adverse effect on the results of operations of the Company in the future. Inventory from contract manufacturers in Asia and Central/South America are purchased in United States dollars and the recent fluctuations of many of these currencies against the United States dollar has not had any material adverse impact on the Company. However, future purchase prices for the Company's products may be impacted by fluctuations in the exchange rate between the United States dollar and the local currencies of the contract manufacturer, which may affect the Company's cost of goods in the future. The Company currently does not believe the potential effects of such fluctuations would have a material adverse effect on the Company. The Company does not believe that the relatively low rates of inflation experienced over the last few years in the United States, where it primarily competes, have had a significant effect on revenues or profitability. The Company's management's discussion and analysis of its financial condition and results of operations are based upon the Company's consolidated financial statements, which have been prepared in accordance with accounting principles generally accepted in the United States. The preparation of these financial statements requires the Company to make estimates and judgments that affect the reported amounts of assets, liabilities, revenues and expenses, and related disclosure of contingent assets and liabilities. On an ongoing basis, the Company evaluates its estimates, including those related to product returns, bad debts, inventories, income taxes, financing operations, contingencies and litigation. The Company bases its estimates on historical experience and on various other assumptions that are believed to be reasonable under the circumstances, the results of which form the basis for making judgments about the carrying values of assets and liabilities that are not readily apparent from other sources. Actual results may differ from these estimates under different assumptions or conditions. The Company writes down its inventory for estimated obsolescence equal to the difference between the cost of inventory and the estimated market value based upon assumptions about future demand and market conditions. If actual market conditions are less favorable than those projected by management, additional inventory write-downs may be required. The Company maintains allowances for doubtful accounts for estimated losses resulting from the inability of its customers and licensees to make required payments. Customers include non-factored accounts, accounts collected by the Company's factors with recourse and credit card receivables from third-party service providers. If the financial conditions of these customers and licensees were to deteriorate and impair their ability to make payments, additional allowances may be required. The Company performs a review of its indefinite-lived intangible assets and long-lived assets for impairment on a quarterly basis or whenever events or changes in circumstances indicate that the carrying amount may not be recoverable. If the total of the expected future undiscounted cash flows is less than the carrying amount of the asset, a loss is recognized for the difference between the fair value and carrying value of the asset. Level 3 - a fair value that is derived from inputs that are unobservable or from observable inputs based on unobservable data in an inactive market. Deferred income taxes reflect the net tax effects of temporary differences between the carrying amounts of assets and liabilities for financial reporting purposes and the amounts used for income tax purposes. Deferred taxes are evaluated for future realization and reduced by a valuation allowance based on income tax accounting guidance applied by management. The Company's assessment of deferred tax assets is performed quarterly and many factors are considered when assessing the likelihood of future realization of deferred tax assets, including the recent earnings experience and expectations of future taxable income by taxing jurisdiction, the carryforward periods available for tax reporting purposes, tax planning strategies and other relevant factors. The actual realization of deferred tax assets may differ significantly from the amounts the Company has recorded. The Company's income taxes are routinely under audit by federal, state or local authorities. These audits include questioning of the timing and amount of deductions and the allocation of income among various tax jurisdictions. Based on its evaluations of tax positions, the Company believes it has appropriately accrued for probable exposures. To the extent the Company is required to pay amounts in excess of recorded income tax liabilities, the Company's effective tax rate in a given financial statement period could be materially impacted. The Company also measures tax position taken or expected to be taken in a return and records them in the financial statements. The Company is periodically involved in various legal actions arising in the normal course of business. Management is required to assess the probability of any adverse judgments as well as the potential range of any losses. Management determines the required accruals after a careful review of the facts of each significant legal action. The Company's accruals may change in the future due to new developments in these matters. In the ordinary course of business, the Company is involved in and subject to compliance and regulatory reviews and audits by numerous authorities, agencies and other governmental agents and entities from various jurisdictions. The Company is required to assess the likelihood of any adverse outcomes of these matters. A determination of the amount of reserves required, if any, for these reviews is made after careful analysis of each individual issue. The reserves may change in the future due to new developments or final resolution in each matter, which may have a significant impact on the Company's results. The Company records all share-based payments, including grants of employee stock options, to be recognized in the financial statements based on their fair value. The Company measures the cost of services received in exchange for stock options and similar awards based on the grant-date fair value of the award and recognizes this cost in the Consolidated Statements of Operations over the period during which an award recipient is required to provide services in exchange for the award. The Company uses the Black-Scholes model to assess the fair value of non-qualified employee stock options and amortizes this cost over the service period. In addition, stock compensation expense is reduced for estimated forfeitures prior to vesting primarily based on historical annual forfeiture rates and by employee classification. Estimated forfeitures are reassessed on a quarterly basis and may change based on new facts and circumstances. Please refer to Footnote 18 for the Company's new accounting pronouncement disclosure. The Company has auction-rate securities, that contain "A" through "double C" rated debt obligations and a preferred share closed end fund that are substantially all insured. All of the Company's auction-rate securities have failed at auction as a result of illiquidity and imbalance in order flow within the market. A failed auction is not an indication of an increased credit risk or a reduction in the underlying collateral; however, parties wishing to sell securities could not do so. Based on current market conditions, it is not known when or if the capital markets will come back into balance to achieve successful auctions for these securities. If these auctions continue to fail, it could result in the Company holding securities beyond their next scheduled auction reset dates and will limit the liquidity of these investments. Based on the Company's expected operating cash flows, and other sources and uses of cash, the Company does not anticipate that the lack of liquidity on these investments will affect its ability to execute its current business plan. These assets have been classified as long-term in the Company's Consolidated Balance Sheet and have been recorded at their fair value. The Company is exposed to currency exchange rate risks with respect to its inventory transactions denominated in foreign currencies, although greater than 95% of the transactions are in U.S. dollars. Business activities in various currencies expose the Company to the risk that the eventual net dollar cash flows from transactions with foreign suppliers denominated in foreign currencies may be adversely affected by changes in currency rates. The Company manages these risks by periodically utilizing foreign exchange contracts. The Company does not enter into foreign currency transactions for trading or speculative purposes. At December 31, 2010, the Company had no foreign exchange contracts outstanding. The Company's earnings may also be affected by changes in short-term interest rates as a result of borrowings that may be made under its credit facilities. A two or less percentage point increase in interest rates affecting the Company's credit facility would not have had a material effect on the Company's 2010 or 2009 operations. The Company sources a significant amount of product from China and is subject to foreign currency exposure. If the Yuan is allowed to float freely against other foreign currency, a two percent change in exchange rates could have a material effect on the cost of future inventory purchases to be transacted by the Company. See page F-1 for an index to the consolidated financial statements, the Report of Management and the Reports of the Registered Public Accounting Firm submitted as part of this Annual Report. As of December 31, 2010, the Company's Chief Executive Officer and Chief Financial Officer have evaluated the effectiveness of the Company's disclosure controls and procedures (as defined in Rules 13a-15(e) and 15d-15(e) of the Exchange Act and have concluded that the Company's disclosure controls and procedures were effective and designed to ensure that all material information required to be disclosed by the Company in reports filed or submitted under the Exchange Act is (1) recorded, processed, summarized and reported within the time periods specified in the SEC rules and forms, and (2) accumulated and communicated to the Company's management, including the Company's Chief Executive Officer and Chief Financial Officer, to allow timely decisions regarding required disclosures. The Company's management is responsible for establishing and maintaining adequate internal control over financial reporting, as such term is defined in Rules 13a-15(f) and 15d-15(f) of the Exchange Act. Under the supervision and with the participation of management, including the Chief Executive Officer and Chief Financial Officer, the Company conducted an evaluation of the effectiveness of its internal control over financial reporting as of December 31, 2010 based on the framework in Internal Control-Integrated Framework issued by the Committee of Sponsoring Organizations of the Treadway Commission (COSO). Based on that evaluation, management concluded that the Company's internal control over financial reporting was effective as of December 31, 2010. The Company's internal control over financial reporting as of December 31, 2010 was audited by Ernst & Young, LLP, an independent registered public accounting firm, as stated in their report which is included herein. There were no changes in the Company's internal controls over financial reporting during its last fiscal quarter that have materially affected, or are reasonably likely to materially affect, the Company's internal control over financial reporting. Except for the information regarding directors and executive officers of the registrant, which is included in Part I of this Form 10-K, the information required by this item will be contained in the Company's Proxy Statement for its Annual Shareholders' Meeting to be held May 25, 2011 to be filed with the SEC within 120 days after December 31, 2010 and which is incorporated herein by reference in response to this item. The information required by this item will be contained in the Company's Proxy Statement for its Annual Shareholders' Meeting to be held May 25, 2011 to be filed with the SEC within 120 days after December 31, 2010 and which is incorporated herein by reference in response to this item. (a) (1) See page F-1 for an index to the consolidated financial statements submitted as part of this Annual Report. (2) Schedule II - Valuation and Qualifying Accounts is required to be filed by Item 8 of Form 10-K.
All other schedules, for which provision is made in the applicable accounting regulations of the SEC are not required under the related instructions, are shown in the financial statements or are inapplicable and therefore have been omitted. 3.01 Restated Certificate of Incorporation of Kenneth Cole Productions, Inc.; Certificate of Merger of Cole Fifth Avenue, Inc. into Kenneth Cole Productions, Inc.; Certificate of Merger of Cole Productions, Inc. into Kenneth Cole Productions, Inc.; Certificate of Merger of Cole Sunset, Inc. into Kenneth Cole Productions, Inc.; Certificate of Merger of Cole Union Street, Inc. into Kenneth Cole Productions, Inc.; Certificate of Merger of Cole West, Inc. into Kenneth Cole Productions, Inc.; Certificate of Merger of Kenneth Cole Woodbury, Inc. into Kenneth Cole Productions, Inc.; Certificate of Merger of Kenneth Cole Leather Goods, Inc. into Kenneth Cole Productions, Inc.; Certificate of Merger of Unlisted into Kenneth Cole Productions, Inc. (Incorporated by reference to Exhibit 3.01 to the Company's Registration Statement on Form S-1, Registration No. 33-77636). 3.02 By-laws. (Incorporated by reference to Exhibit 3.02 to the Company's Registration Statement on Form S-1, Registration No. 33-77636). 3.03 Certificate of Amendment of the Certificate of Incorporation of Kenneth Cole Productions, Inc. dated October 15, 2007 (Previously filed as Exhibit 10.32 to the Registrant's Quarterly Report on Form 10-Q for the quarterly period ended September 30, 2007 and incorporated herein by reference). 4.01 Specimen of Class A Common Stock Certificate. (Incorporated by reference to Exhibit 4.01 to the Company's Registration Statement on Form S-1, Registration No. 33-77636). 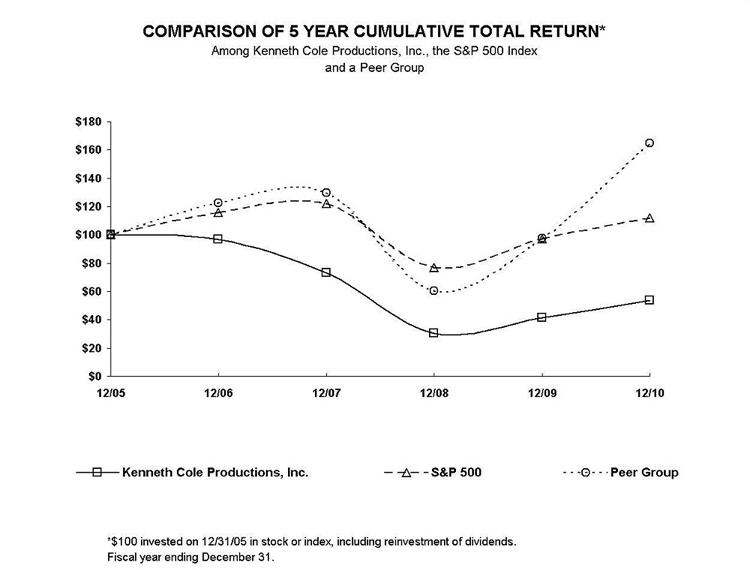 *10.01 Kenneth Cole Productions, Inc. 1994 Stock Option Plan. (Incorporated by reference to Exhibit 10.04 to the Company's Registration Statement on Form S-1, Registration No. 33-77636). *10.02 Amended and Restated Kenneth Cole Productions, Inc. 1994 Stock Option Plan (Previously filed as an Exhibit to the Registrant's Proxy Statement filed on April 22, 1997 and incorporated herein by reference). 10.03 Kenneth Cole Productions, Inc. Employee Stock Purchase Plan (Incorporated by reference to the Company's Registration Statement on Form S-8 Registration No. 33-31868, filed on March 7, 2000). 10.04 Kenneth Cole Productions, Inc. 2004 Stock Incentive Plan (Incorporated by reference to the Company's Registration Statement on Form S-8 Registration No. 333-119101, filed on September 17, 2004). 10.05 Kenneth Cole Productions, Inc. 2004 Stock Incentive Plan (Incorporated by reference to the Company's Registration Statement on Form S-8 Registration No. 333-131724 filed on February 10, 2006). 10.06 Kenneth Cole Productions, Inc. 2004 Stock Incentive Plan (Amended and Restated as of April 20, 2005) (Previously filed as Exhibit 10.26 to the Registrant's Quarterly Report on Form 10-Q for the quarterly period ended March 31, 2006 and incorporated herein by reference). 10.07 Kenneth Cole Productions, Inc. Sample Grant Award Letter (Previously filed as Exhibit 10.27 to the Registrant's Quarterly Report on Form 10-Q for the quarterly period ended March 31, 2006 and incorporated herein by reference). 10.08 Employment Agreement between Kenneth Cole Productions, Inc. and Michael DeVirgilio dated March 31, 2006 (Previously filed as Exhibit 10.28 to the Registrant's Quarterly Report on Form 10-Q for the quarterly period ended June 30, 2006 and incorporated herein by reference). 10.09 Credit Agreement between J.P. Morgan Securities Inc., JPMorgan Chase Bank, National Association, PNC Bank, National Association, Bank of America, N.A., and Wachovia Bank, National Association, and Kenneth Cole Productions, Inc. dated as of December 20, 2006. (Previously filed as Exhibit 10.31 to the Registrant's Annual Report on Form 10-K for the year ended December 31, 2006 and incorporate herein by reference). 10.10 Employment Agreement between Kenneth Cole Productions, Inc. and Jill Granoff dated May 5, 2008 (Previously filed as Exhibit 10.33 to the Registrant's Quarterly Report on Form 10-Q for the quarterly period ended March 31, 2008 and incorporated herein by reference). 10.11 Receivables management agreement between The CIT Group/Commercial Services, Inc. and Kenneth Cole Productions, Inc. dated November 7, 2008. 10.12 Amendment No. 2 to the Credit Agreement between J.P. Morgan Securities Inc., JPMorgan Chase Bank, National Association, PNC Bank, National Association, Bank of America, N.A., and Wachovia Bank, National Association, and Kenneth Cole Productions, Inc. dated as of July 30, 2009. (Previously filed as Exhibit 10.01 to the Registrant's Current Report on Form 8-K filed on August 6, 2009). 10.13 Amended and Restated Credit Agreement between J.P. Morgan Securities Inc., JPMorgan Chase Bank, National Association, PNC Bank, National Association, Bank of America, N.A., and Wachovia Bank, National Association, and Kenneth Cole Productions, Inc. dated as of July 30, 2009. (Previously filed as Exhibit 10.01 to the Registrant's Current Report on Form 8-K filed on August 6, 2009). +23.01 Consent of Independent Registered Public Accounting Firm. +23.02 Consent of Independent Appraisal Firm. +23.03 Consent of Independent Appraisal Firm. +31.1 Certification of Chief Executive Officer pursuant to Securities Exchange Act Rule 13a-14 and 15d-14, as adopted pursuant to Section 302 of the Sarbanes-Oxley Act of 2002. +31.2 Certification of Chief Financial Officer pursuant to Securities Exchange Act Rule 13a-14 and 15d-14, as adopted pursuant to Section 302 of the Sarbanes-Oxley Act of 2002. +32.1 Certification of Chief Executive Officer pursuant to 18 U.S.C. Section 1350, as adopted pursuant to Section 906 of the Sarbanes-Oxley Act of 2002. +32.2 Certification of Chief Financial Officer pursuant to 18 U.S.C. Section 1350, as adopted pursuant to Section 906 of the Sarbanes-Oxley Act of 2002. * Management contract or compensatory plan or arrangement required to be identified pursuant to Item 15(a) (3) of this report. To The Board of Directors and Shareholders of Kenneth Cole Productions, Inc.
We have audited the accompanying consolidated balance sheets of Kenneth Cole Productions, Inc. and subsidiaries (the "Company") as of December 31, 2010 and 2009, and the related consolidated statements of operations, changes in shareholders' equity, and cash flows for each of the three years in the period ended December 31, 2010. Our audits also included the financial statement schedule listed in the Index at Item 15(a). These financial statements and schedule are the responsibility of the Company's management. Our responsibility is to express an opinion on these financial statements and schedule based on our audits. In our opinion, the financial statements referred to above present fairly, in all material respects, the consolidated financial position of the Company at December 31, 2010 and 2009, and the consolidated results of its operations and its cash flows for each of the three years in the period ended December 31, 2010, in conformity with U.S. generally accepted accounting principles. Also, in our opinion, the related financial statement schedule, when considered in relation to the basic financial statements taken as a whole, presents fairly in all material respects the information set forth therein. As discussed in Note 4 to the consolidated financial statements, the Company changed its method of accounting for other-than-temporary impairment on investments with the adoption of the guidance originally issued in FASB Staff Position FAS 115-2, FAS 124-2, and EITF 99-20-2, Recognition and Presentation of Other-Than-Temporary Impairments (codified in FASB ASC Topic 320, Investments - Debt and Equity Securities) effective June 15, 2009. We also have audited, in accordance with the standards of the Public Company Accounting Oversight Board (United States), the Company's internal control over financial reporting as of December 31, 2010, based on criteria established in Internal Control-Integrated Framework issued by the Committee of Sponsoring Organizations of the Treadway Commission and our report dated March 7, 2011 expressed an unqualified opinion thereon. We have audited Kenneth Cole Productions, Inc. and subsidiaries' (the "Company") internal control over financial reporting as of December 31, 2010 based on criteria established in Internal Control-Integrated Framework issued by the Committee of Sponsoring Organizations of the Treadway Commission (the "COSO criteria"). The Company's management is responsible for maintaining effective internal control over financial reporting, and for its assessment of the effectiveness of internal control over financial reporting included in the accompanying Management's Report on Internal Control over Financial Reporting. Our responsibility is to express an opinion on the Company's internal control over financial reporting based on our audit. In our opinion, the Company maintained, in all material respects, effective internal control over financial reporting as of December 31, 2010, based on the COSO criteria. We also have audited, in accordance with the standards of the Public Company Accounting Oversight Board (United States), the consolidated balance sheets of the Company as of December 31, 2010 and 2009, and the related consolidated statements of operations, changes in shareholders' equity, and cash flows for each of the three years in the period ended December 31, 2010, and our report dated March 7, 2011 expressed an unqualified opinion thereon.